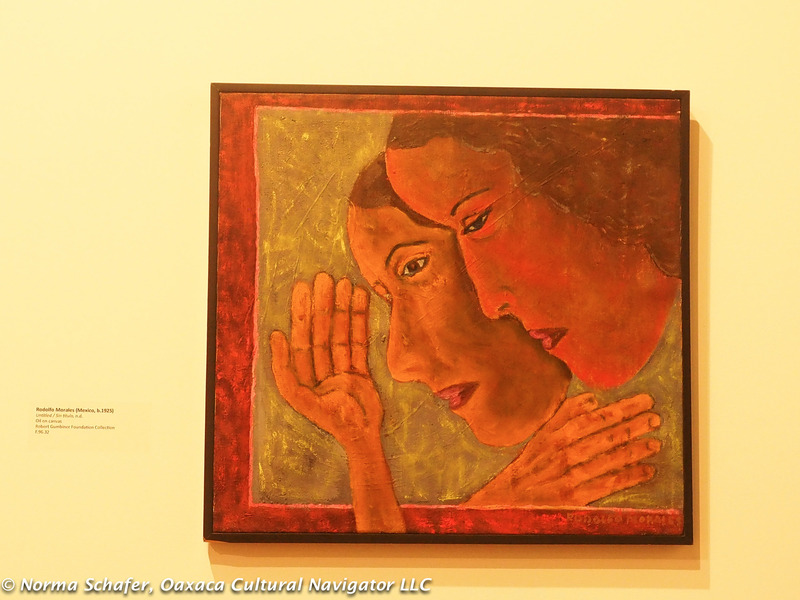 After hiking the wetlands trails of Bolsa Chica (little purse) Ecological Reserve in Huntington Beach along the Pacific Ocean, my son decided we should take in some local culture at the Museum of Latin American Art (MOLAA) in nearby Long Beach. What’s there? 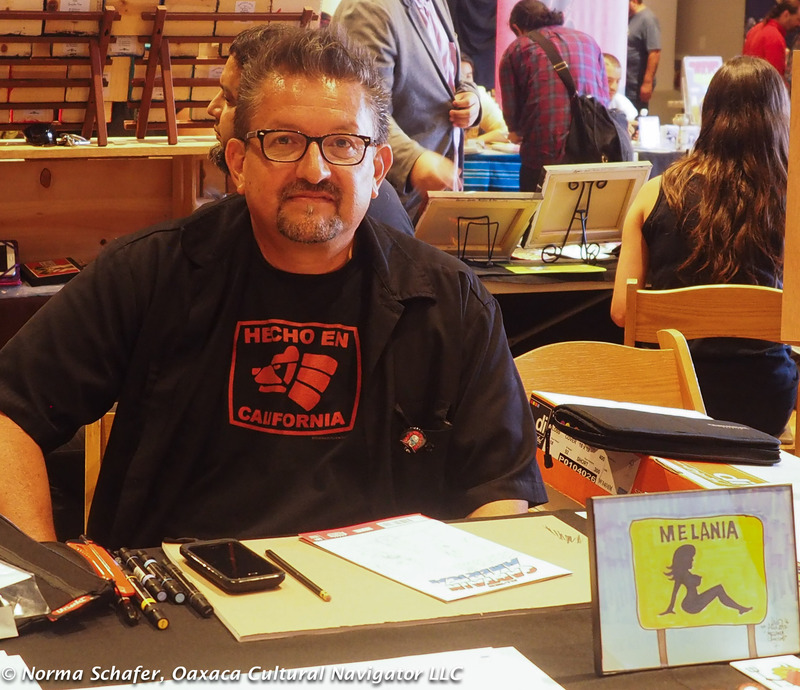 The Latino Comics Expo to celebrate it’s 5th anniversary at MOLAA, age 20. The Expo was created by Javier Hernandez and Ricardo Padilla. 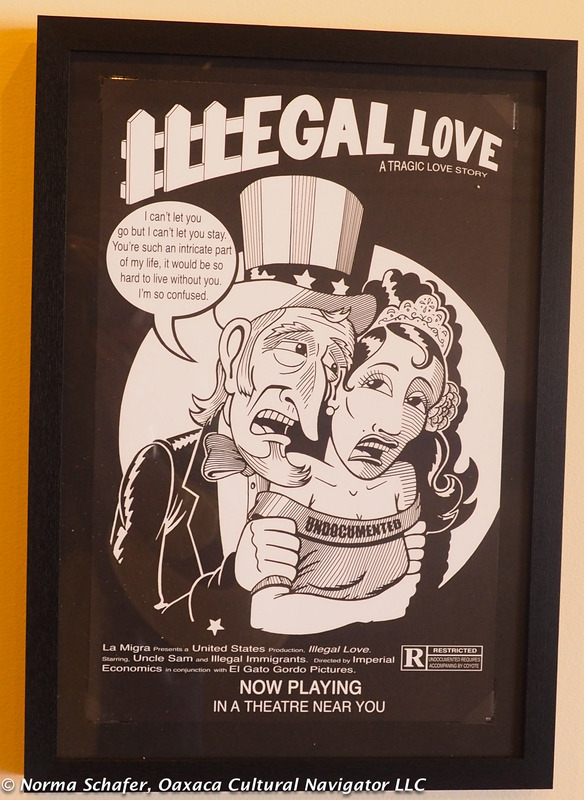 They started it at the San Francisco Cartoon Art Museum in 2011. This is their second time at MOLAA. They mounted the first expo there in 2013. 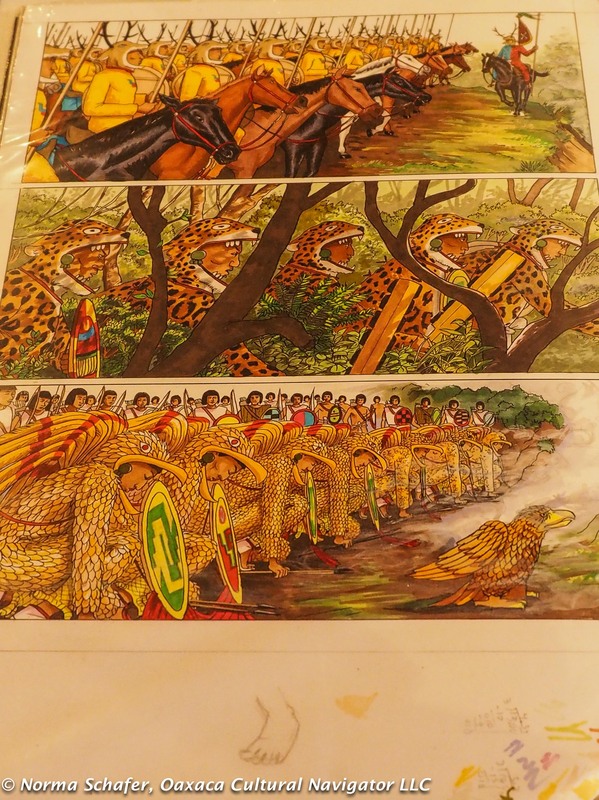 As a lover of Oaxaca graphic arts, it’s not a stretch for me to consider that comics are a natural extension of the great Mexican tradition of illustrator Jose Guadelupe Posada. 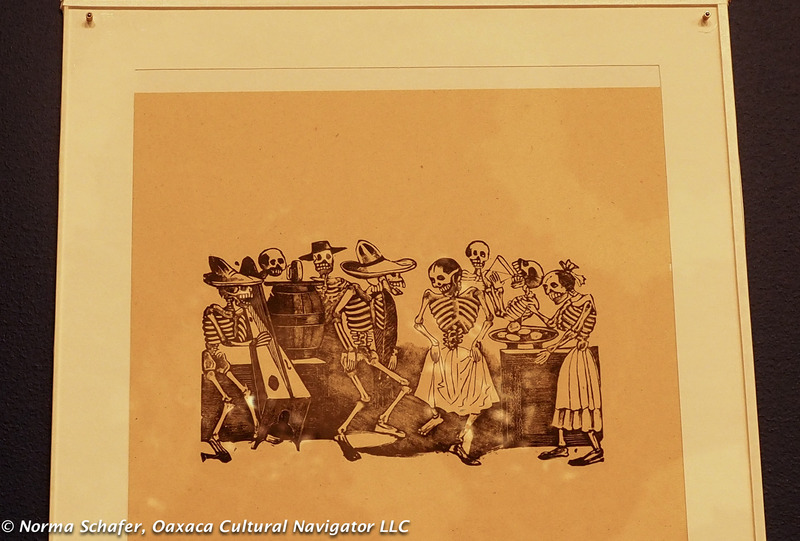 In fact, there are Posada illustrations on exhibit at this museum, too. 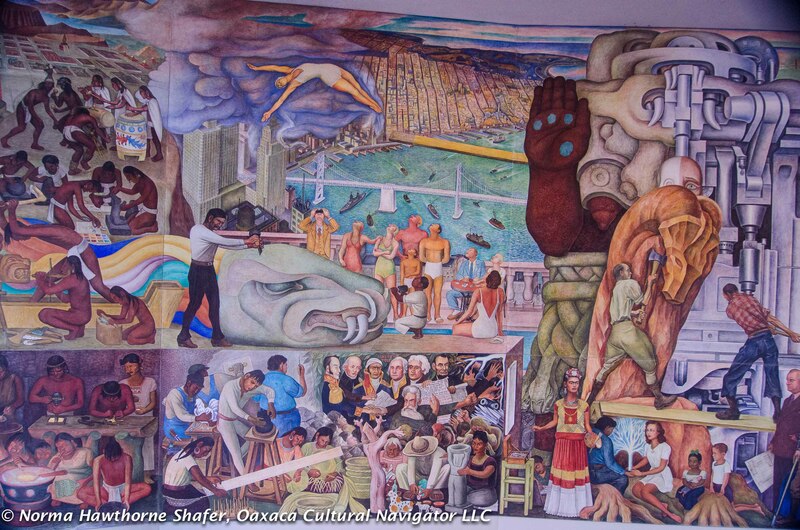 After all, Posada is Diego Rivera’s hero and he features him prominently, and fondly, in the mural Dream on a Sunday Afternoon in the Alameda Park (Mexico City). 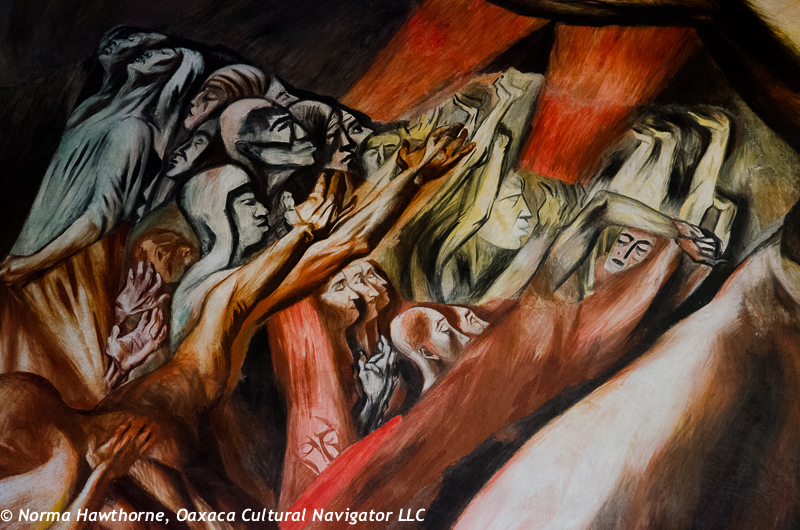 Muralists Jose Clemente Orozco and David Alfaro Siquieros form the second and third legs of the Mexican Muralist Movement stool. They used caricature, too, as prominent artistic expression in their work. 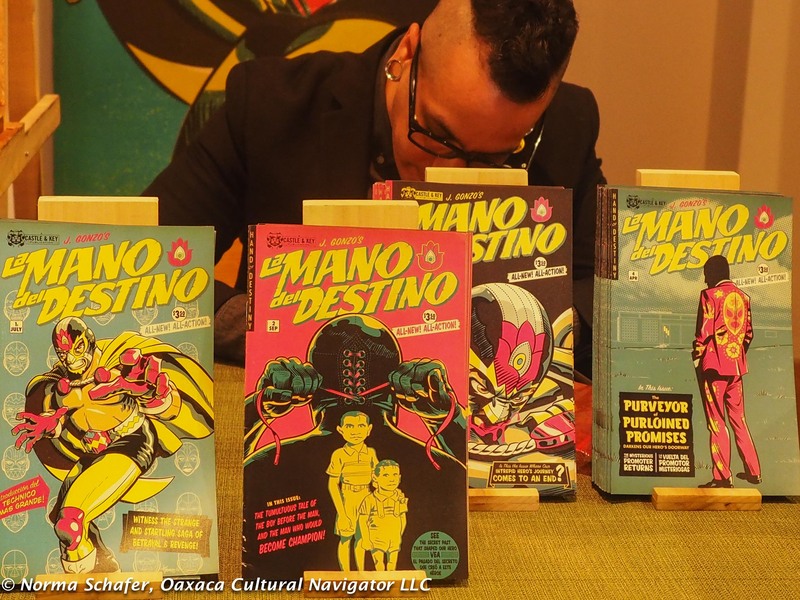 The Latino comics tradition of Los Angeles is rooted in these antecedents. 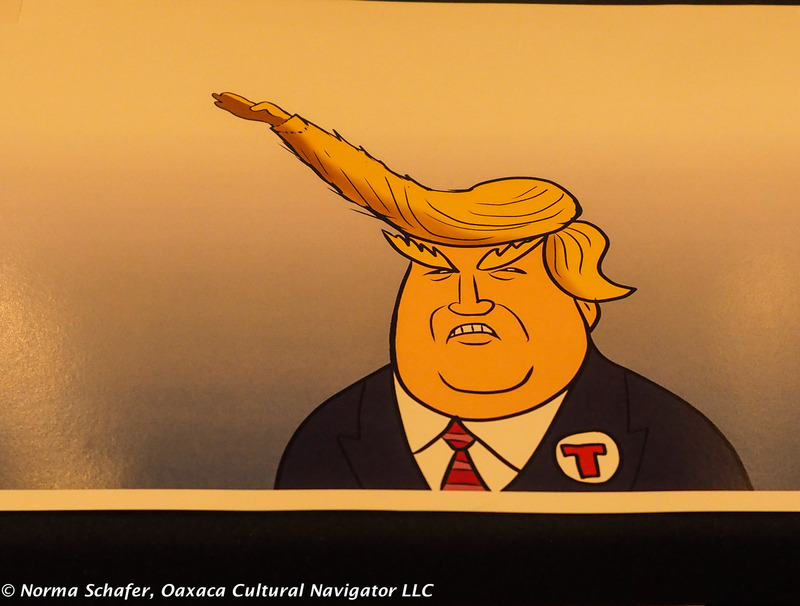 Illustrators used and continue to use political parody in their work, just as Posada, Rivera, Orozco and Siquieros did one hundred years ago to poke at their adversaries. Do you think they use pesticides? Who is harvesting? What is health risk? 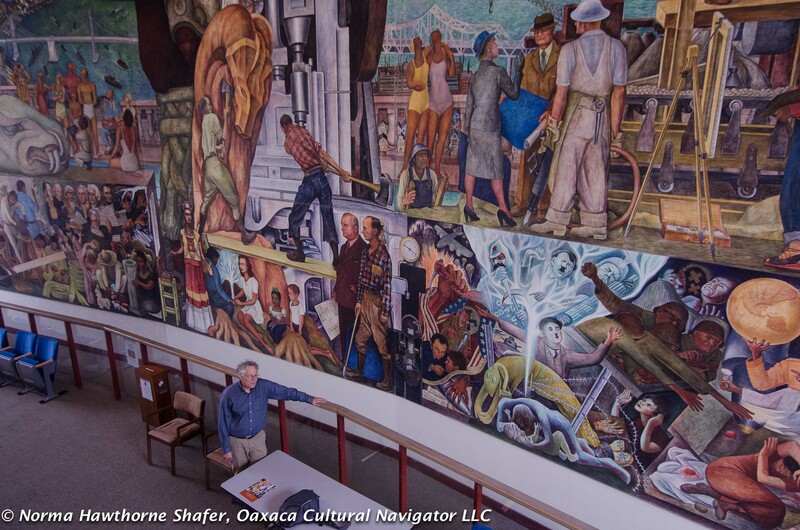 In the permanent exhibition, Ramiro Gomez, son of Mexican immigrants, reflects his experiences and stories growing up in a working class family. His art (above) focuses on class difference and the people behind a socially constructed representation of luxury. 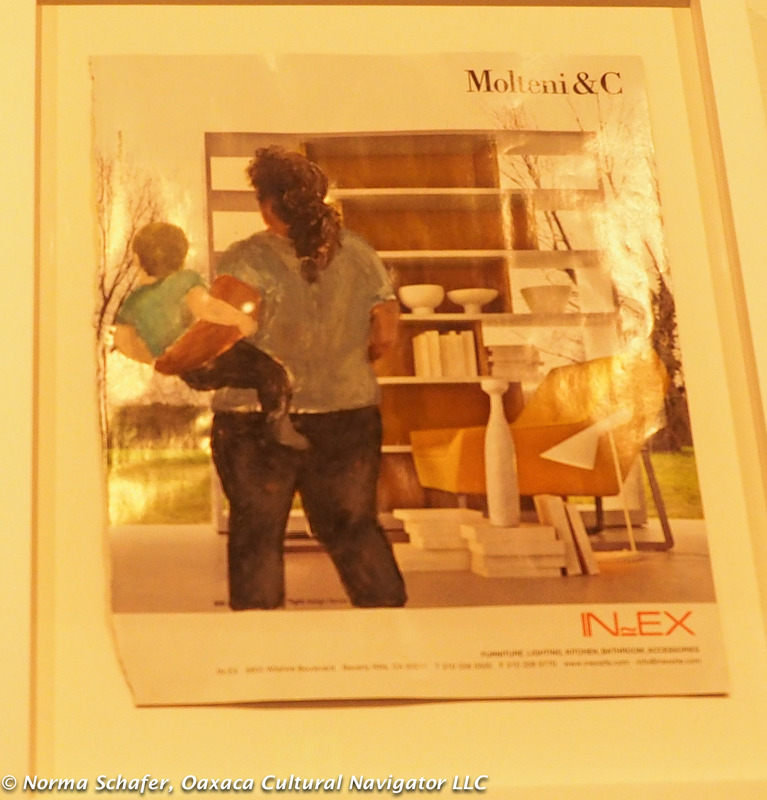 He tears out advertisements from upscale magazines and superimposes domestic workers into the composition. 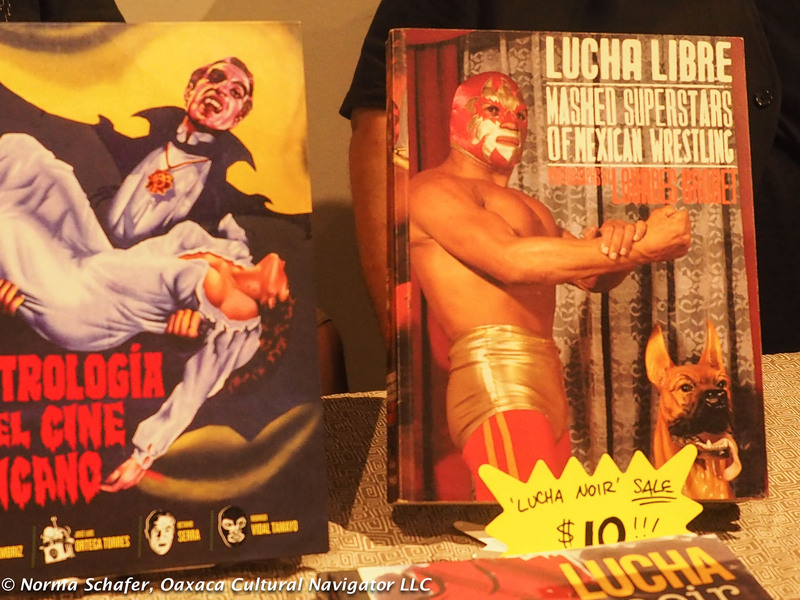 The Latino Comics Expo was a two-day event, August 6 and 7. There were about 50 illustrators there demonstrating their work, selling books, posters, postcards, t-shirts, ball caps and pins. 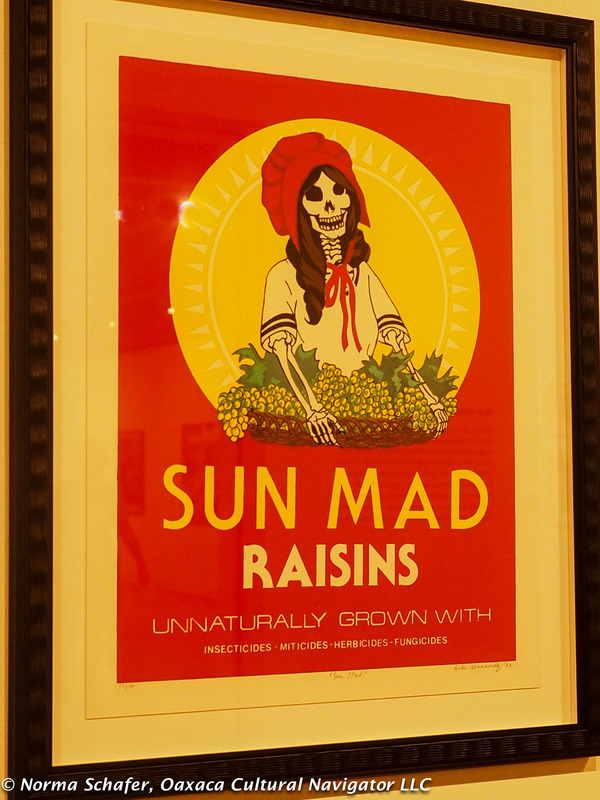 Some works were prints, silkscreen, engravings and hand-illustrated with colored pen. 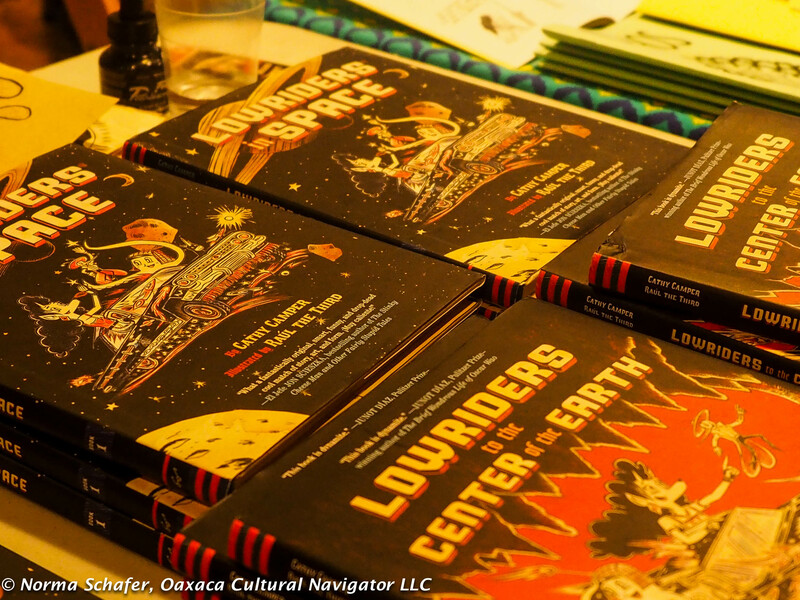 Lowriders to the Center of the Earth, illustrated by Raul the Third, grabbed my attention. So did the lowrider on the cover, an integral part of my growing-up years in the San Fernando Valley when young Latinos/Chicanos altered their Chevys, Fords and Chryslers. Tuck and roll leather seats. Raked front ends. Flashing lights. Flames. The more elaborate, the better. Illustrator Lalo Alcarez. Political & social justice commentary, too. Plus a little pin-up. The t-shirt Lalo Alcarez (above) wears, Hecho en California, speaks to the strong influences of Latino culture in the second largest city of America. 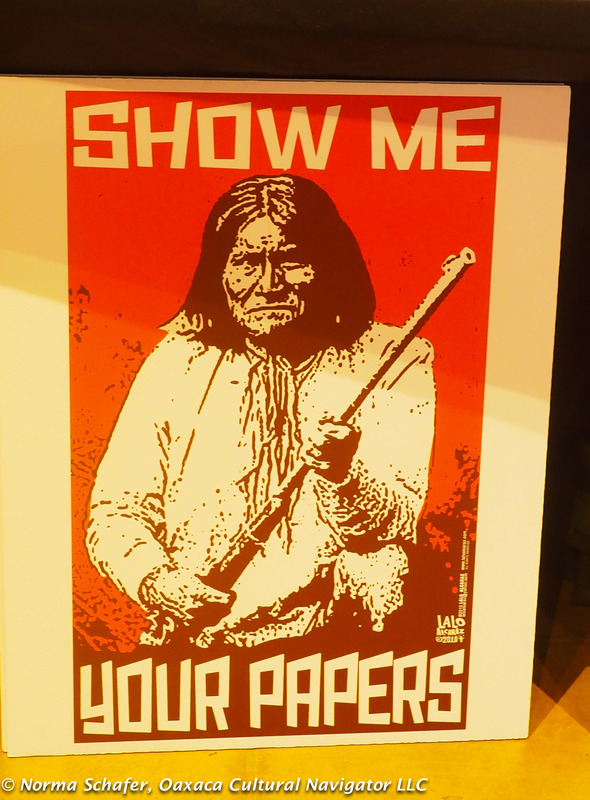 As I looked around at the posters and books, I thought, this is great art, just like what I’m used to seeing at the Oaxaca printmaking studios of Fernando Sandoval and La Chicharra. I walked away with an autographed book copy of Lowriders. Hand-colored illustration of the Conquest. With codices footnotes. Then, my son tells me, mom, he’s pretty famous. He’s published in L.A. Weekly. What do I know? 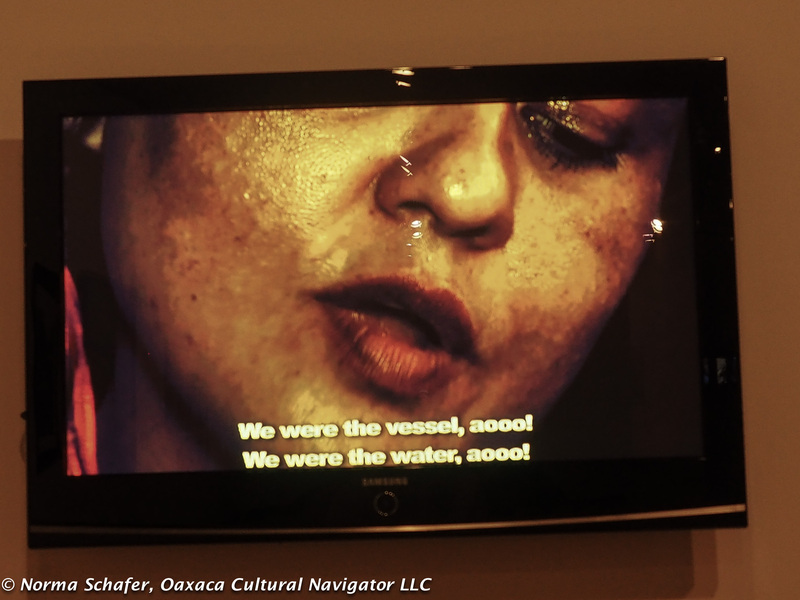 As I turned the corner to go through the regular exhibition, there was a video interview with Oaxaca poet Natalia Toledo talking about the importance of literacy and preserving Zapotec culture. Natalia also designs extraordinary jewelry (available for sale at the Museo Textil de Oaxaca gift shop). Versatile like her father, Francisco Toledo. Comic book art/illustration defines the culture and sub-culture, makes a political, social commentary and moral observation about the world that can be humorous, biting and truth-telling. 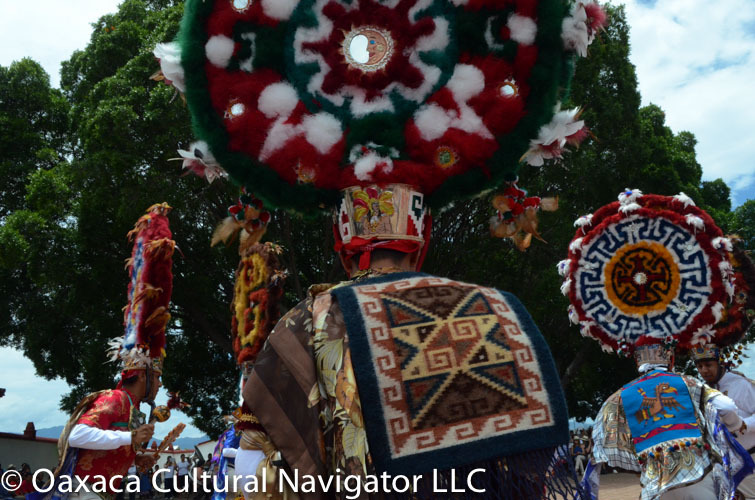 What if Native Americans had asked immigrating English, French and Spanish for their papers? Uncle Sam wants YOU! Who else will clean homes, harvest food? 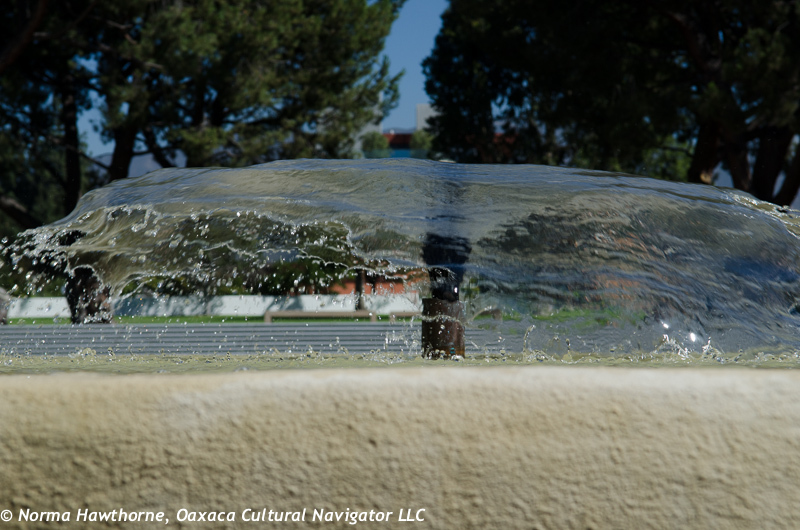 After over a wonderful, satisfying month visiting family and friends, I’m back home in quiet, calm Oaxaca. No freeway congestion or the lure of mall shopping, over-priced lunches and dinners, blustering television pundits that I admit had me addicted to the next adrenaline fix. My wi-fi service is now reconnected and it’s raining. What could be better? Now for a bit of sopa de pollo con limon (chicken with lime soup). This was an experiment. 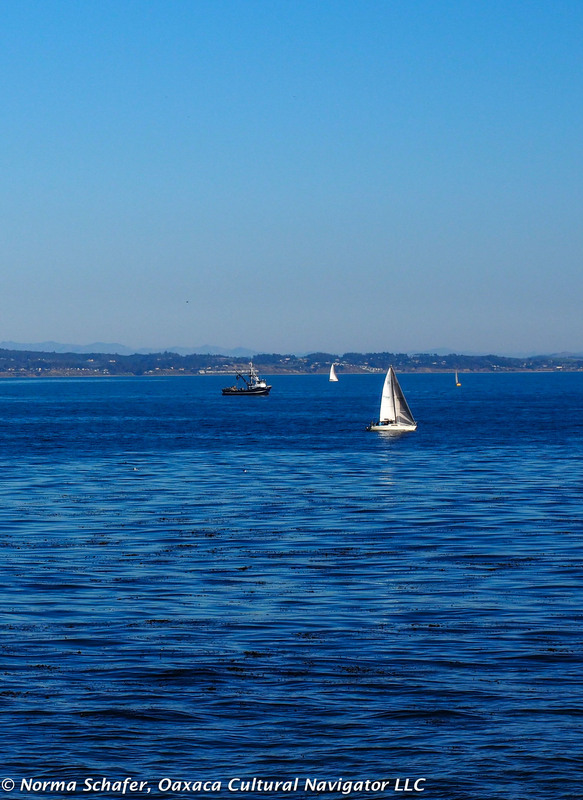 It seemed easy enough and the cost was far less: take a Southwest Airlines (WNA) flight from San Jose (SJC), California. 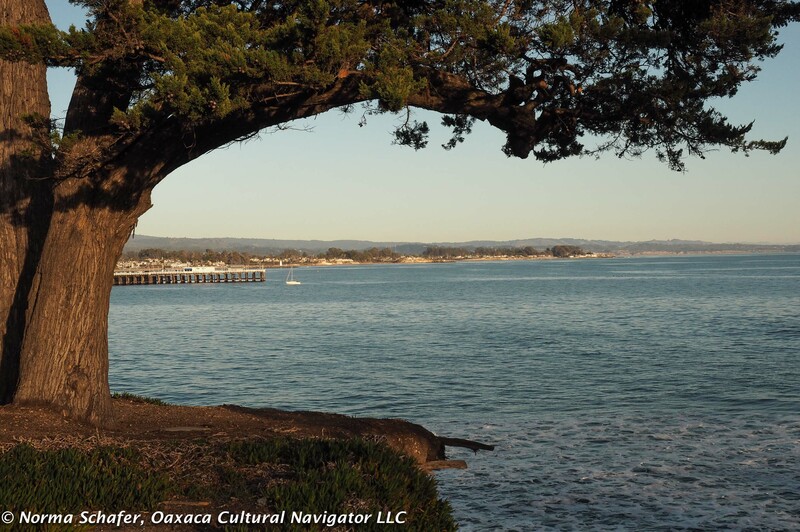 Connect in Orange County (SNA) and fly directly from there to Mexico City. Arrive in time for an afternoon nap and settle in. Easy. Except that even by arriving at the airport by 5 a.m., the hour-and-a-half line to get through security meant that I missed my flight by two minutes. Along with about 40 other people. We stood in another line for an hour to get rebooked. And, with few options, I have a six-hour delay plus the hop-hop-hop flight plan that Southwest is famous for, going first to Las Vegas, then Houston, then Mexico City. Ah, the vagaries of travel during peak season (after Thanksgiving) wtih a high security alert on top of that. So, here’s the good news. 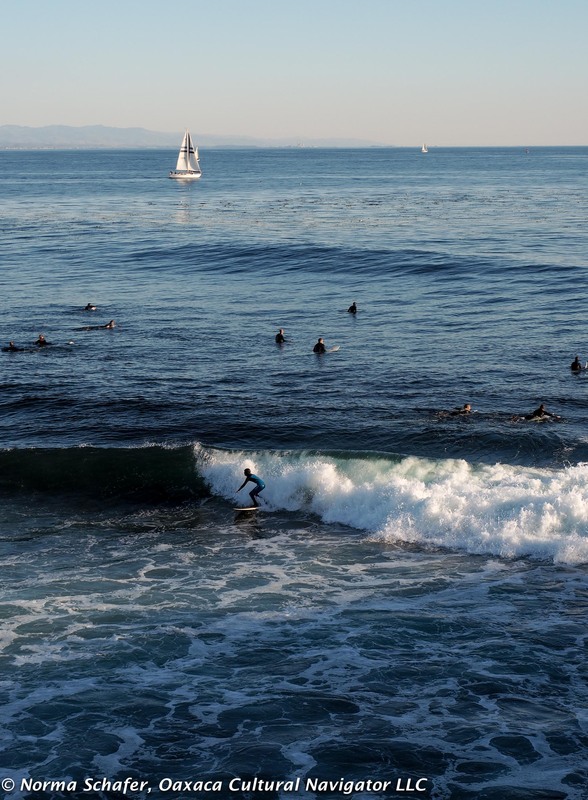 I’m in the SJC airport editing photographs that I took on my new mirrorless Olympus OMD M5 Mark II camera in Santa Cruz. It weighs a fraction of my Nikon D7000 when I use the 17-55mm Nikkor lens, which is a big plus! I did a lot of research before I bought this one, so here is hoping. The verdict is still out on whether the photo quality matches up. But, I’m inclined to consider that the convenience could outweigh any negatives. I’m still learning the settings, so we shall see. 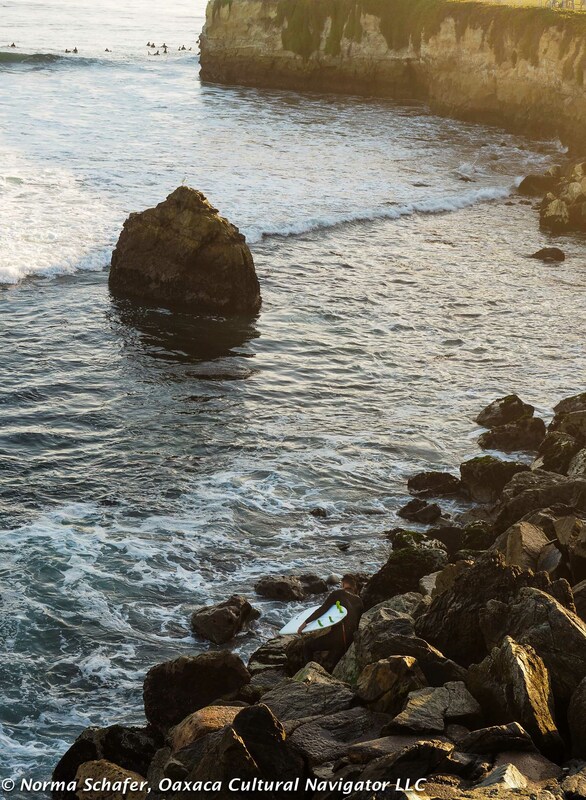 This post includes experimental photos I took with my sister and son in Santa Cruz on West Cliff Drive overlooking the famous area where surfers, runners and strollers convene. 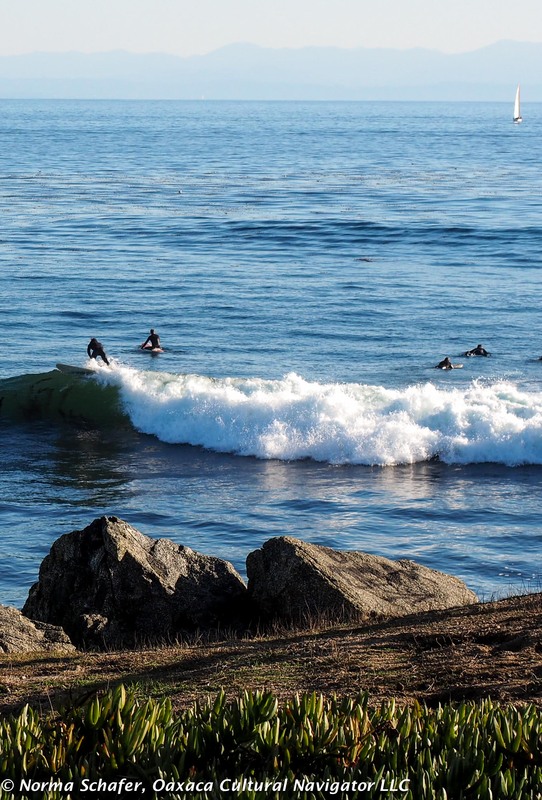 The perfect beach life, even at the end of November. 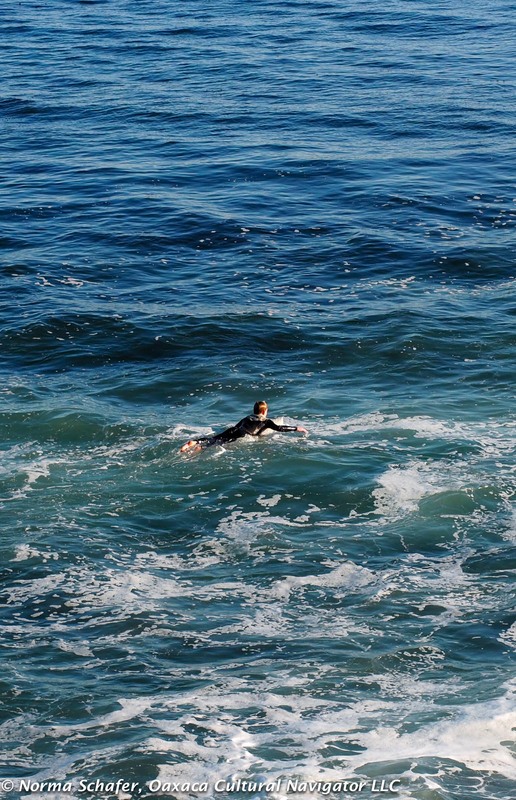 This was a great last day in California, perfect for focusing out onto the horizon. 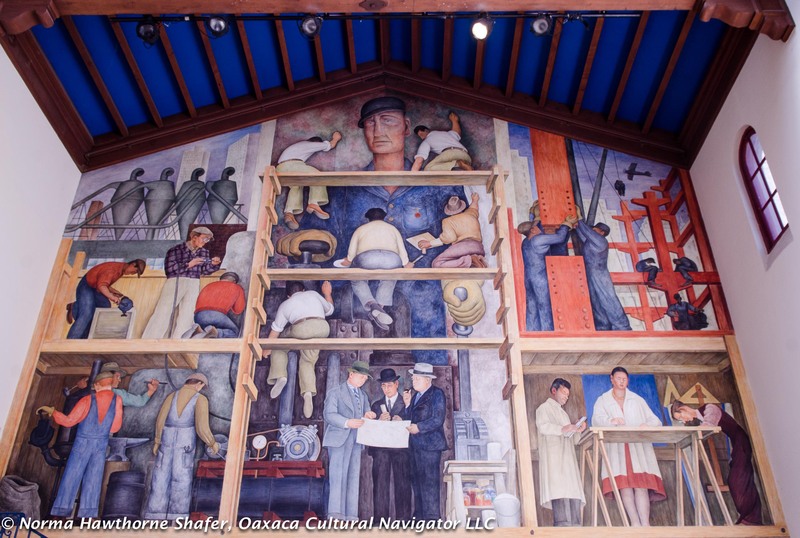 There are three Diego Rivera frescoes in San Francisco, California. To get in to see them all is not easy, but it is well worth the effort. 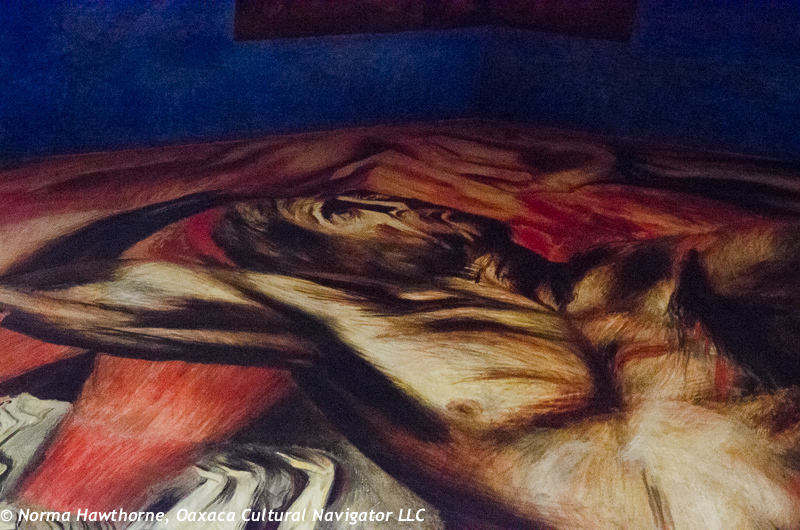 It was an incredible treat to be able to see these frescoes up close and personal. A word of advice: it’s very important to plan and confirm your visits in advance. 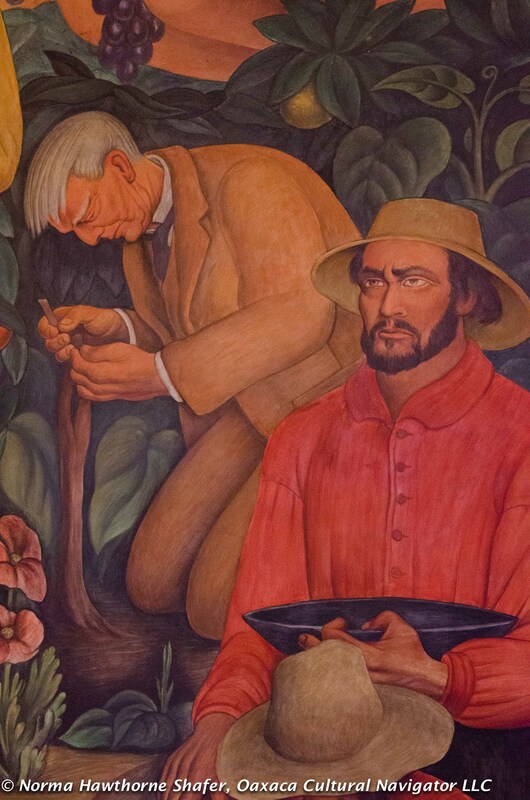 In Mexico, Rivera intended his murals to be accessible to the public. 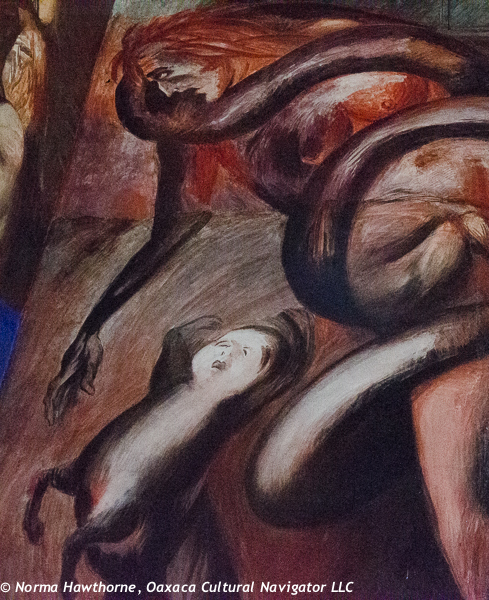 That was an important social and political premise of the Mexican Muralist Movement — art for and of the people. 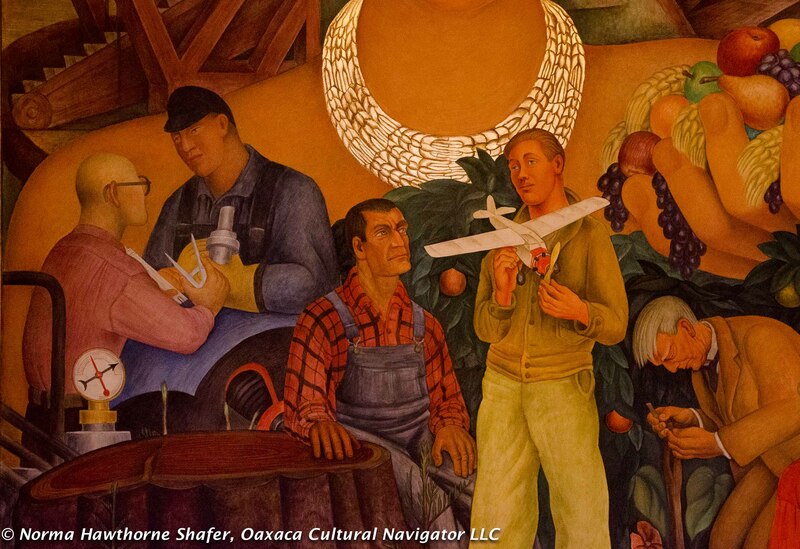 All are filled with consistent Rivera themes: the worker, the common soldier, the peasant farmer and industry. 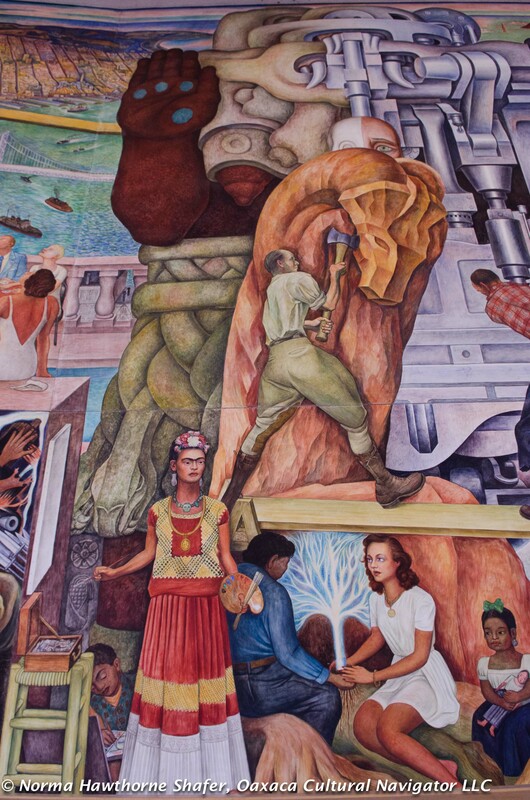 These murals mirror those in Mexico City of the same era (like Man, Controller of the Universe) and I recognize similar scenes and characters. 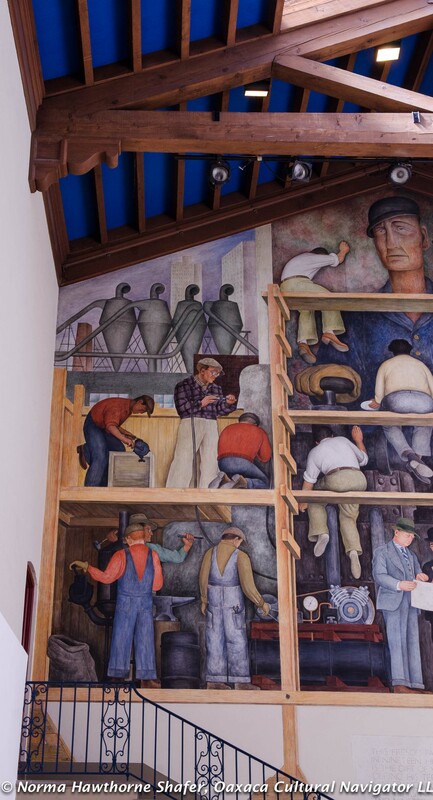 The most accessible fresco is The Making of a Fresco Showing the Building of a City at the San Francisco Art Institute, open 9 a.m. to 7 p.m. This is a private, degree-granting university. 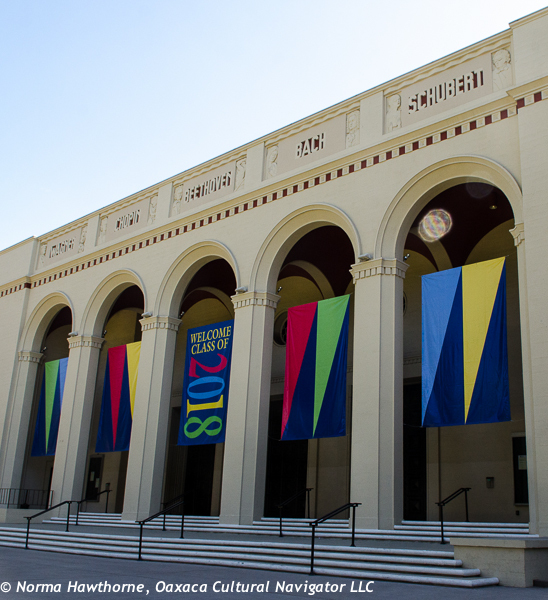 Doors are open to students and to the public Monday through Friday. Check for weekend hours. 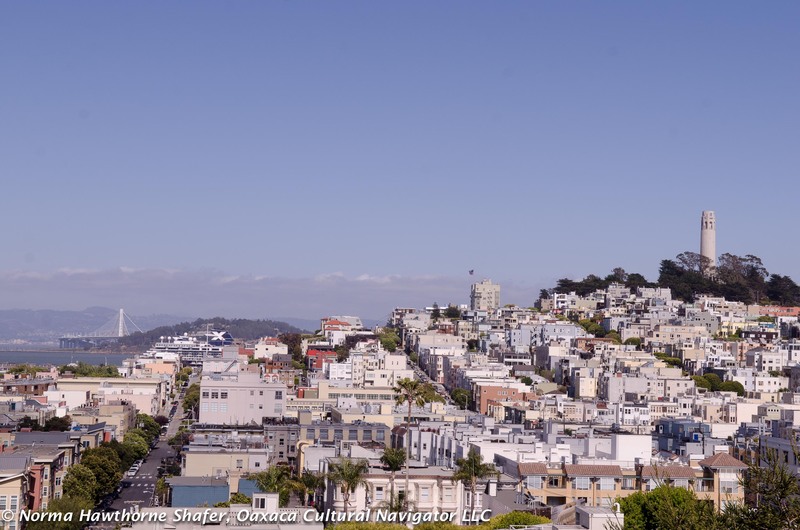 The challenge is to find parking around the steep Cow Hollow hills. But if you are in a taxi or take UBER, no worries. 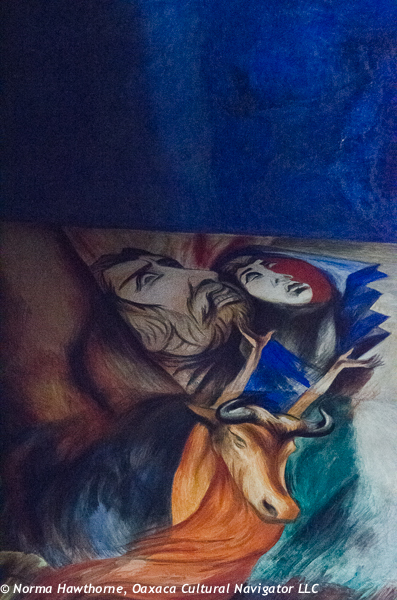 The mural is at the end of a student exhibition gallery space on the main level to the left of the entry courtyard. We followed good directional signs to get there. Once inside, the floor to ceiling wall art dominates the space. This is a painting within a painting. 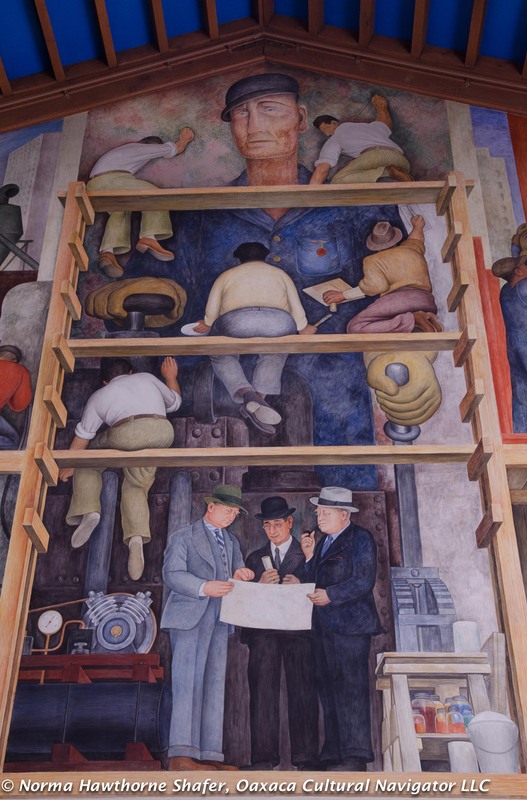 Rivera included himself (back to viewer, with his ample frame centered on the scaffolding) with helpers making a fresco. 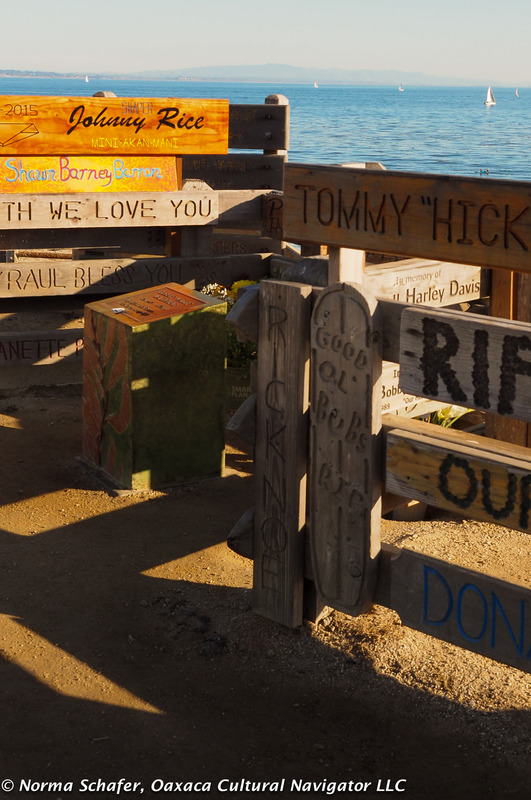 His patrons who financed the project are part of the set. It reminds me of the caricature portraits we see at the Palacio Nacional depicting the history of Mexico that Rivera started in 1929 at about the same time. 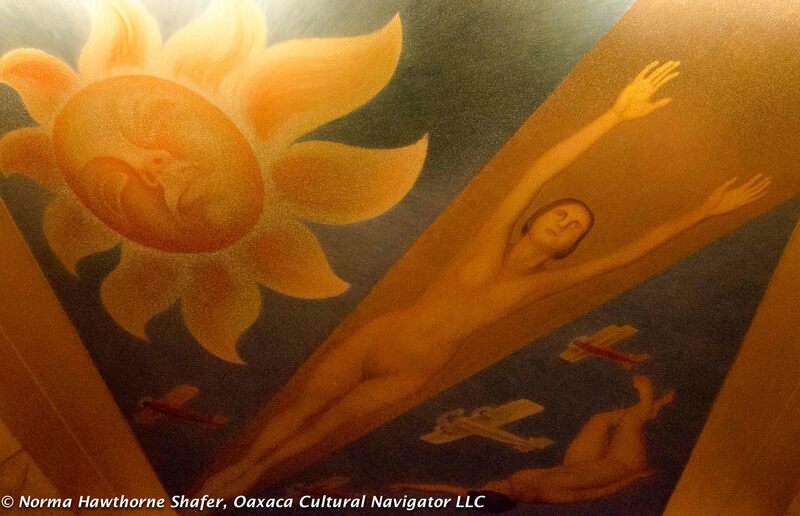 In fact, this Mexico City mural was not completed for another ten years because of commissions like this one in the U.S. It is very Rivera with a bold figures, the central one wearing a red star. You will see a lot of similarities here if you are familiar with his style. There is a small donation box in front suggesting support for mural preservation. We didn’t find hand-out information, art history notes or guestbook. The best descriptions are online, which I suggest you read before visiting. 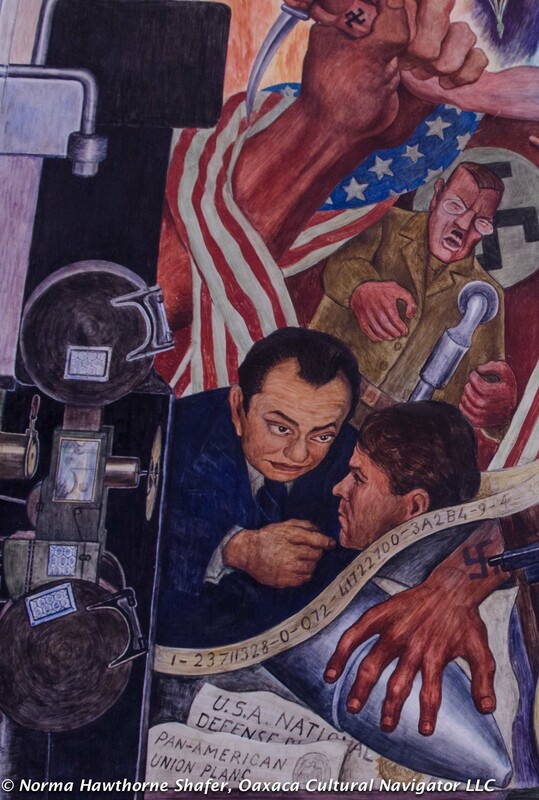 Located in the Sunset on a hill overlooking the Pacific Ocean, City College of San Francisco boasts a comprehensive historical reference mural to The Marriage of the Artistic Expression of the North and the South on this Continent. 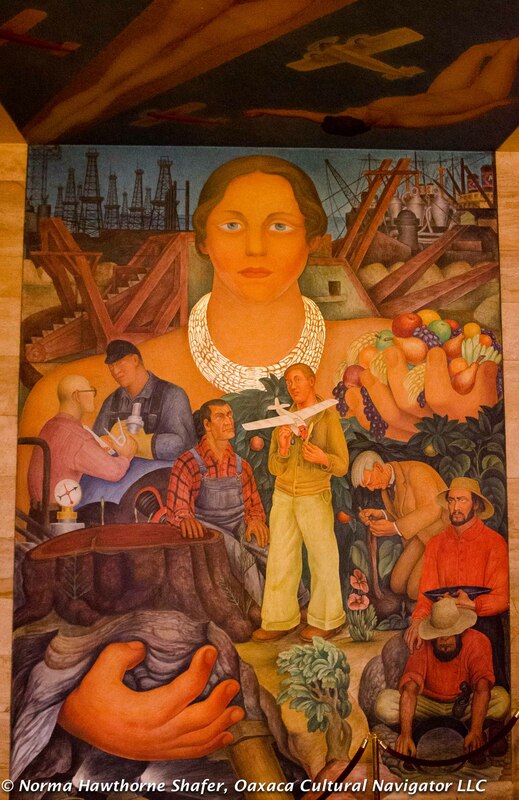 Informally called The Pan American Unity Mural, Rivera painted it in 1940 for the Golden Gate International Exposition on Treasure Island. He was invited by civic and arts leaders to participate in the Exposition’s “Art in Action” program, joining other prominent artists. Fair-goers watched while Rivera and his assistants painted! Frida Kahlo, who marries Rivera for the second time in San Francisco in 1940, stands front and center, while Rivera, his back to the viewer, holds the hand of actress Paulette Goddard. 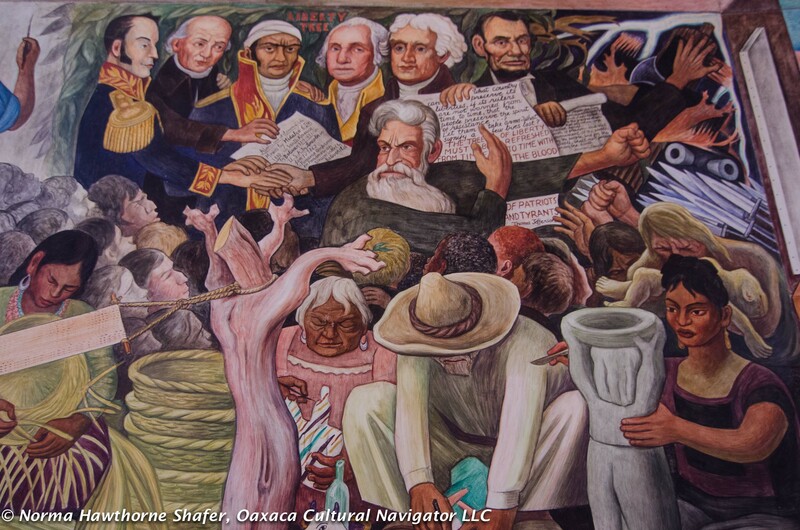 This mural is the most political of the three San Francisco pieces and is parallel in style to the Palacio Nacional mural of the same era, each featuring the founding fathers of Mexico and the USA. Because of state funding cuts, visiting hours at SFCC are limited. 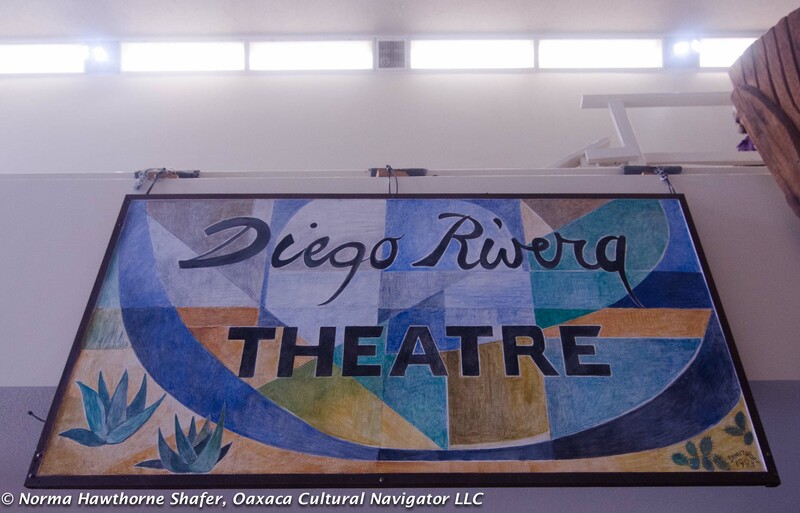 Please consult the website to see when there is a volunteer faculty/staff member scheduled to open the Diego Rivera Theatre where the mural can be seen. This important mural is housed in a very cramped space. I was told that for years the intent has been to build a larger gallery to view it. 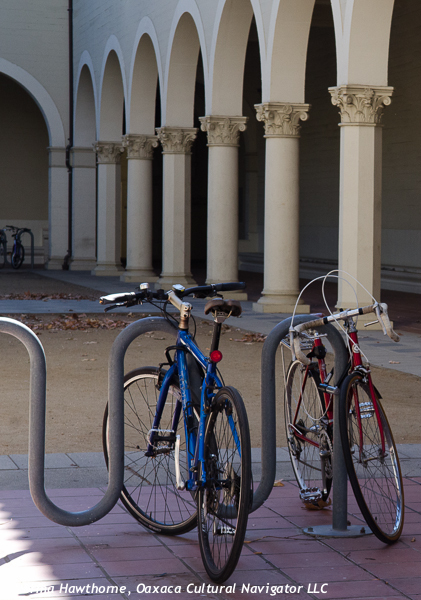 But … the college depends on designated private gifts to realize project goals. A small donation box sits in front of the mural. 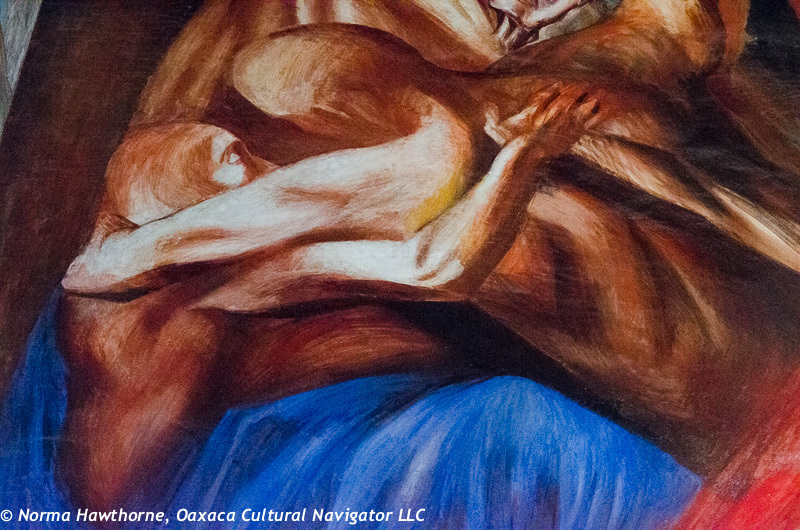 We gave more than requested for a beautiful, thorough art history brochure with color photo. Thanks to the college for providing this! Notes: Be sure to walk upstairs to a small balcony (don’t trip, it’s also used for storage) to get the most expansive view of the mural. 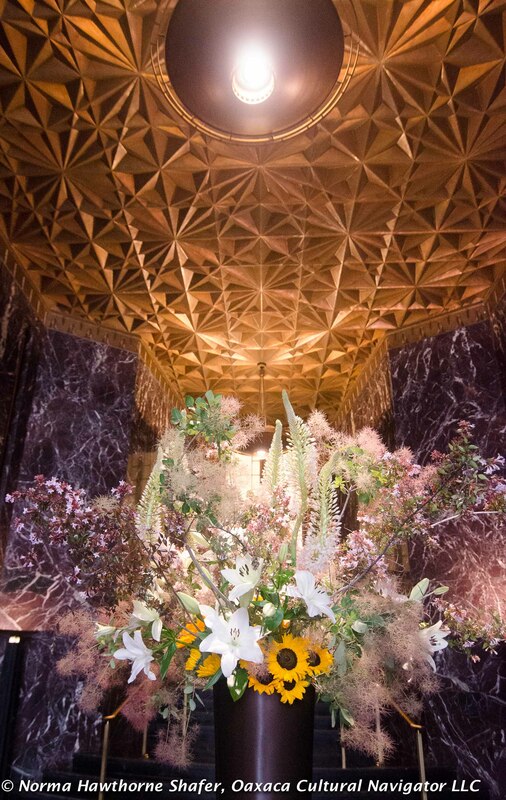 From above, the center view is obstructed by a large carved wood sculpture that obstructs the experience. Free street parking available. Rivera asked Olympic swimmer Helen Willis to model. Our experience at The City Club of San Francisco, an exclusive, members only space on the 10th floor of the former Pacific Stock Exchange, proved that you can’t always trust what you read online, even from USA Today. 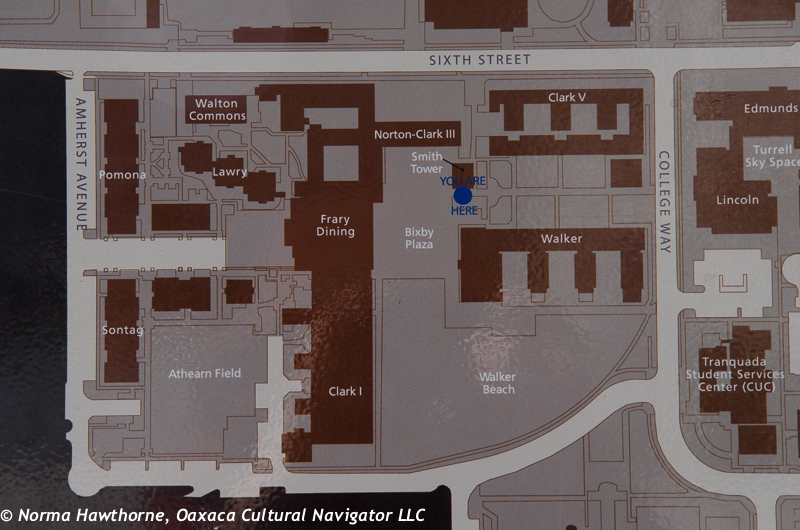 We read the mural was open for viewing from 3 to 5 p.m., Monday through Friday. Not exactly true. We found out the hard way that you can only gain entrance to see the mural if you make an appointment in advance with a City Club staffer. Denied entry and after repeated phone calls from the lobby that all went to voicemail, we finally connected with a live person. When I introduced myself and requested a visit, I got a harsh scolding about not having an appointment, a tirade about this being a private club, a rant about not to trust internet information, then a reluctant agreement to allow us upstairs to see the mural for ten minutes. We were shocked by staff behavior because of the club’s great reputation for hospitality. As we emerged from the elevator, the staffer hid a candy jar from her desktop where she sits sentry on the landing in front of the mural. Seems other riffraff before us dipped into the candy dish and she is keeping a watchful eye. The staffer we met is definitely the gatekeeper. You need to call in advance, make an appointment and purr. I wouldn’t say you know me. Do you think Diego would roll over in his grave? Call in advance to each site to confirm opening times. 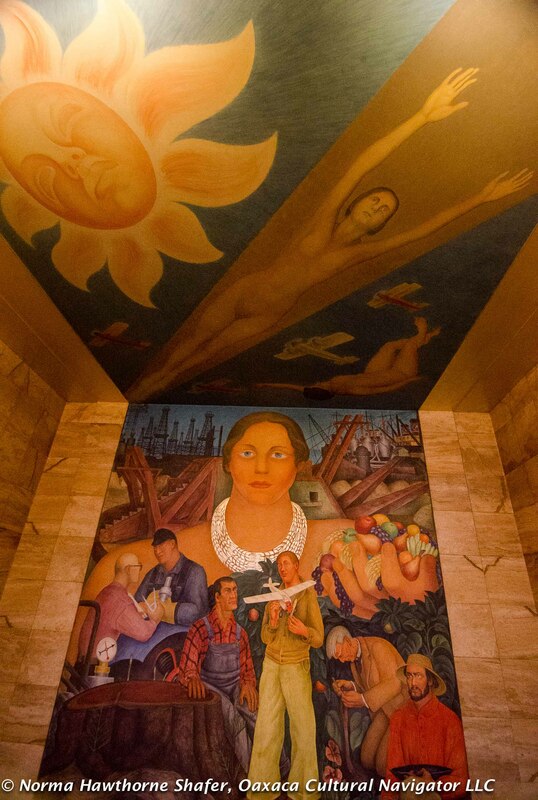 Make an advance appointment directly with The City Club to see the mural there. Educate yourself. 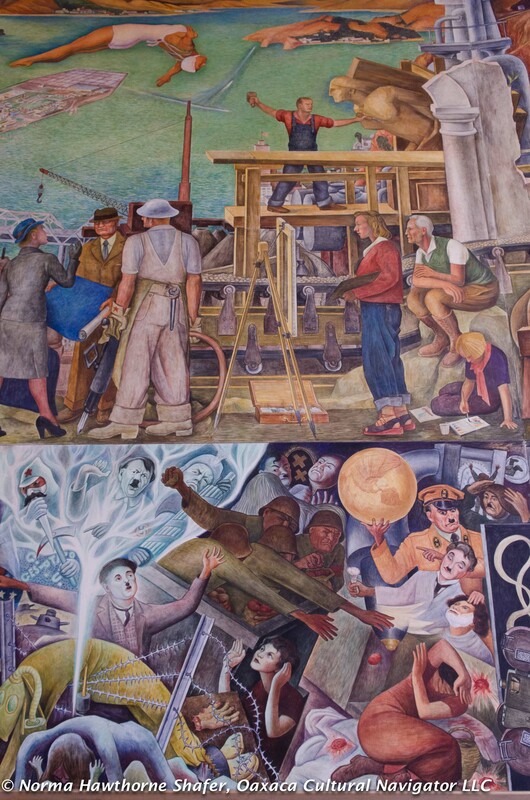 Read about each mural in advance since only the City College of San Francisco may publish an art history description. 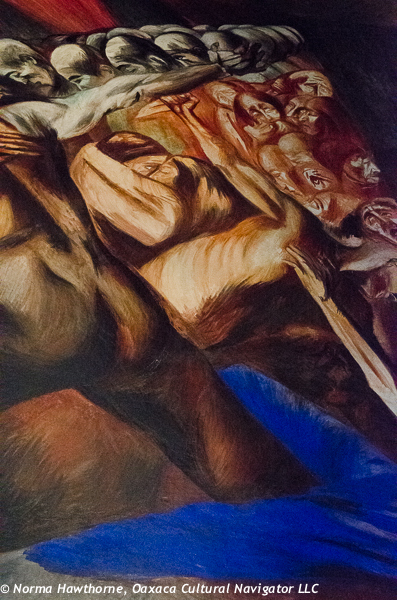 Devote a half-day for visiting the three murals. They are in different parts of the city and traffic can be difficult. Be ready to pay at least $16 per hour to park near the City Club if you are driving a car. Park farther out and use UBER. Be prepared to be disappointed. You may not get in to all venues. 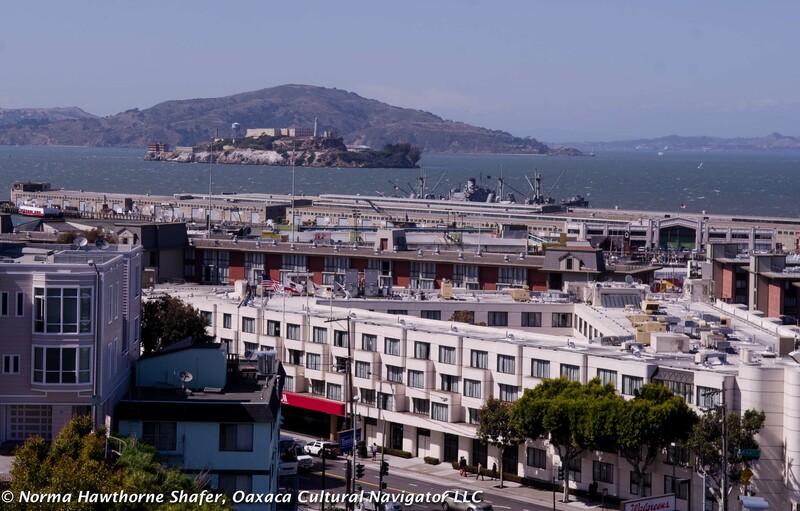 View from the rooftop terrace, SF Art Institute with Alcatraz. A BIG thank you to East Bay friend Mary Ann for organizing this day and driving to all parts of The City. Coit Tower from the SF Art Institute rooftop terrace. See the Bay Bridge? 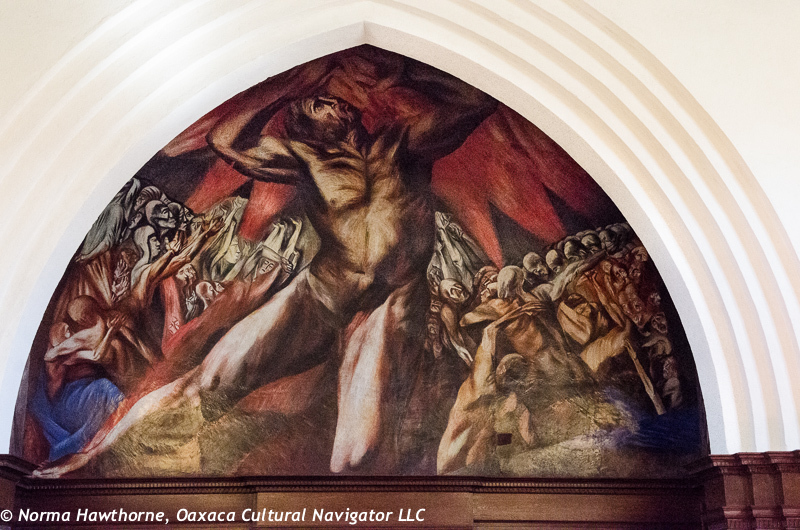 Last week while I was visiting my son in Southern California, I decided to make a pilgrimage to see Jose Clemente Orozco’s famed mural at Pomona College. 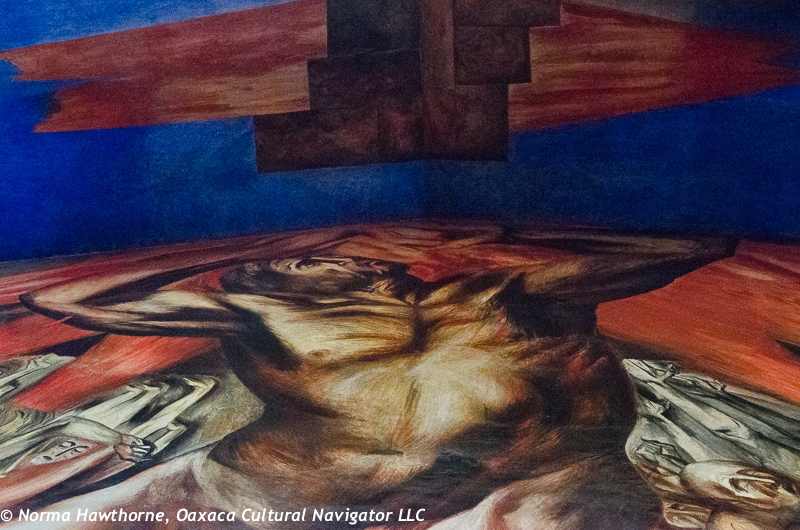 Orozco, along with Diego Rivera and David Alfaro Siquieros, is one of the Three Grand Masters of Mexican Muralism. 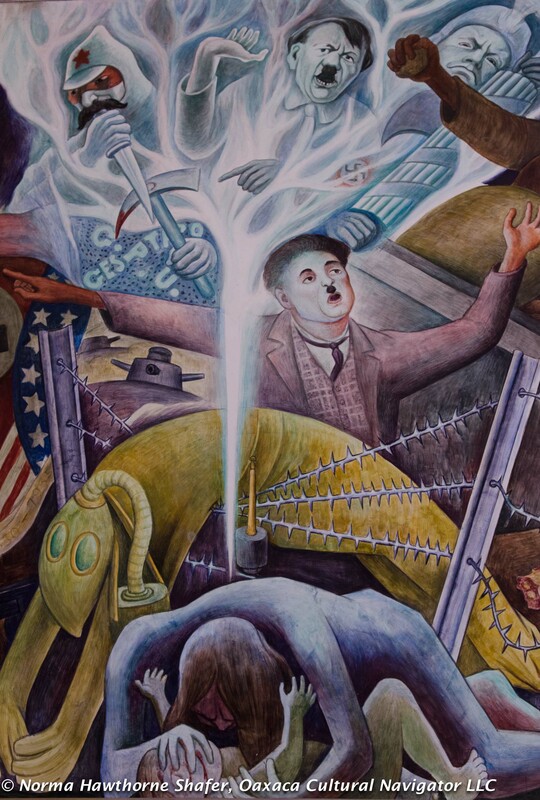 Like a three-legged stool, the study of one balances and informs the work of the others as they shaped and reflected post-revolutionary (1910-1920) Mexico art and politics. 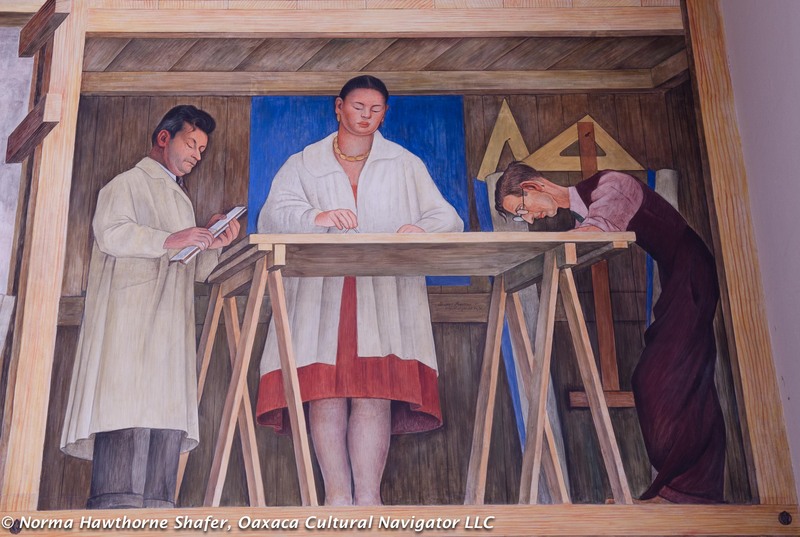 During our Looking for Diego Rivera and Frida Kahlo Art History Tour in Mexico City (coming up November 13-17), Orozco and Siquieros figure predominantly in what we see since they all painted frescoes in Mexico City’s public spaces. We compare and contrast the styles of these three to better understand how they interpreted social and political change within the context of their personal beliefs and values. 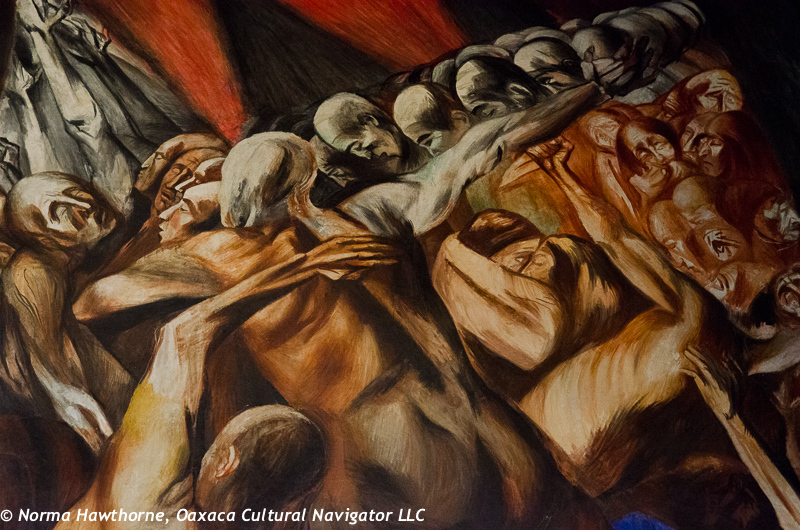 Orozco’s work is powerful, compelling and monumental. 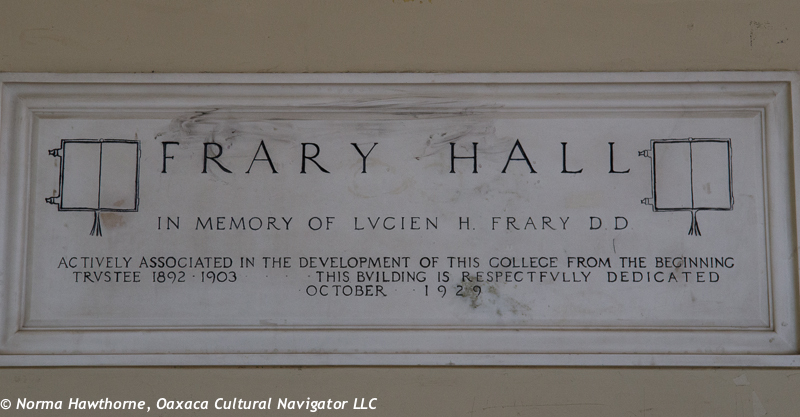 So, I take art historian Valeria’s advice to see this work in Frary Dining Hall at Pomona College. 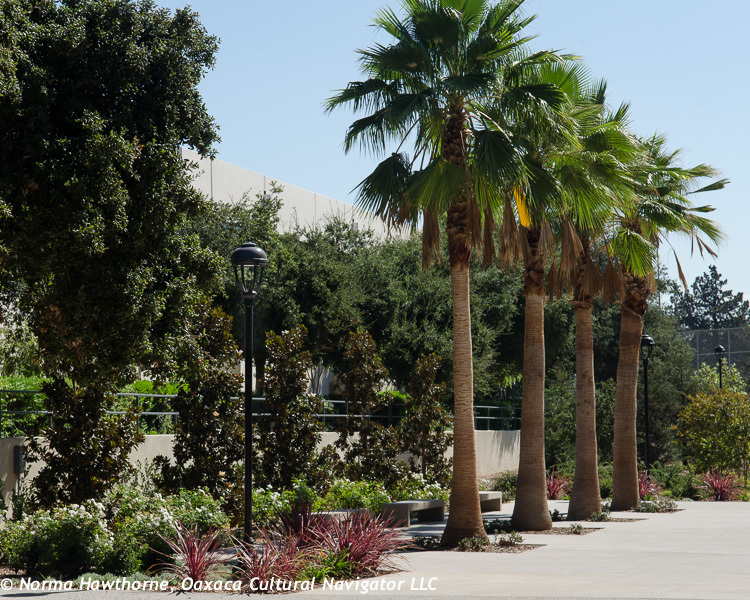 It’s summer and I call ahead to make sure of the dining hall hours to be certain I can enter (breakfast is served 8-9:30 p.m. and lunch is 11:30 a.m. to 1 p.m.), then prepare my route from the beach to the foothills of the San Gabriel Mountains, navigating a series of freeways. This is the land I grew up in and I’m completely at home. The trip takes about an hour and I arrive a bit after ten in the morning. A good time to travel since I am going in the opposite direction from morning rush-hour traffic heading toward downtown Los Angeles. 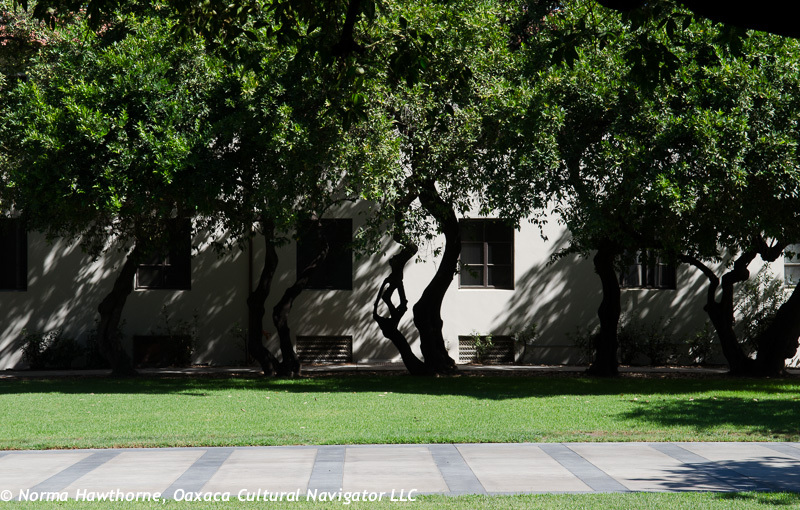 Pomona College is private, liberal arts and part of the Claremont Colleges Consortium. 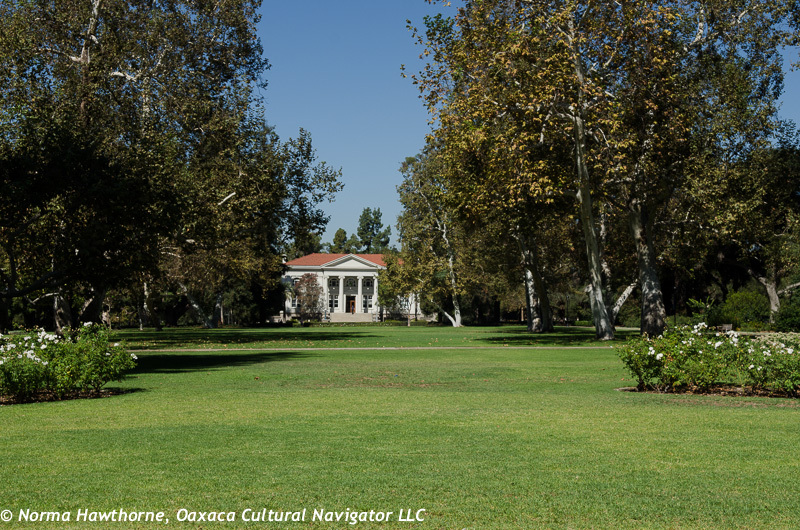 The grounds are carefully manicured and the buildings convey the ambience of of classic California architecture, combining southwest colonial Spanish influences with art deco style. I loved walking the park-like, tree-lined pedestrian avenues filled with talented young people representing every multicultural mix in the world. 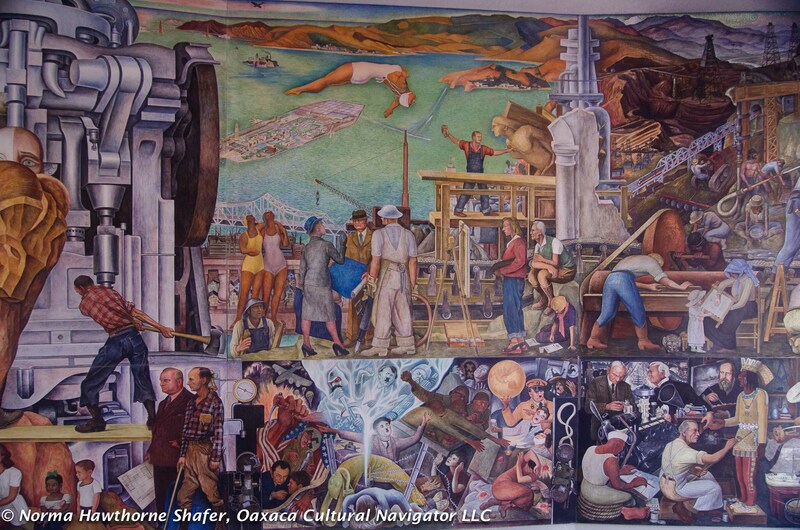 Orozco painted and completed his mural in 1930, at the start of the Great Depression. 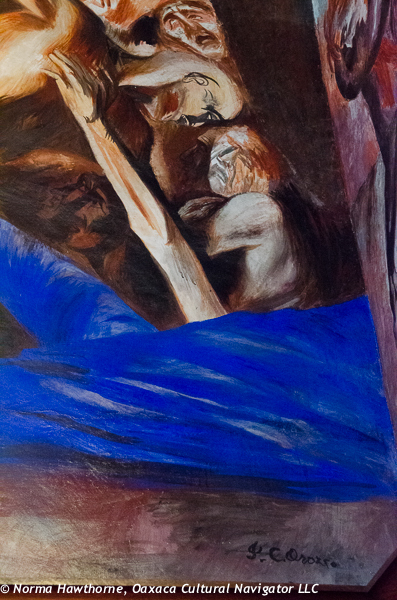 There is an extensive art history discussion of the mural so I won’t go into much detail here, other than to say that Prometheus incurred the wrath of Zeus when he gifted humankind with fire — a symbol of learning, enlightenment and innovation — a perfect metaphor for a relatively new institution of higher education. 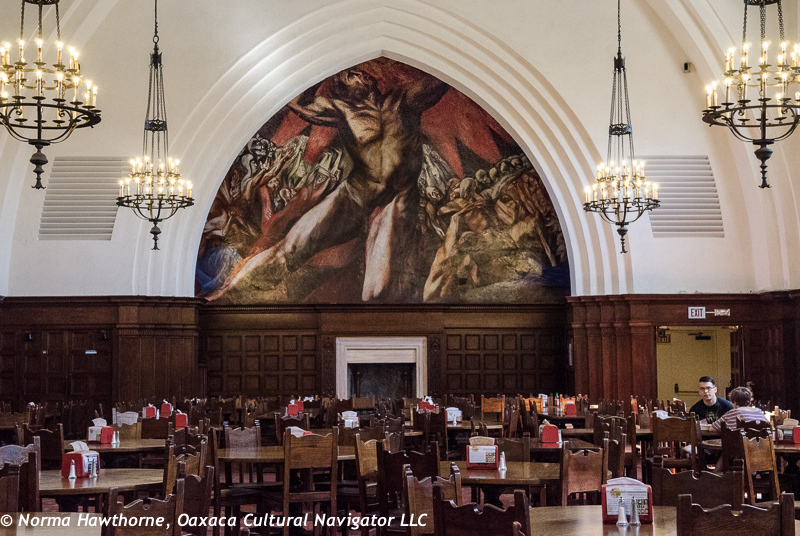 I decided to stay and have brunch in the richly paneled dining hall that students call Hogwarts, bought a meal ticket for $7.50, and settled in for the next hour-and-a-half to take photos, people watch, and gaze at the ironwork, paneled walls, and the play of light on Orozco’s masterpiece. 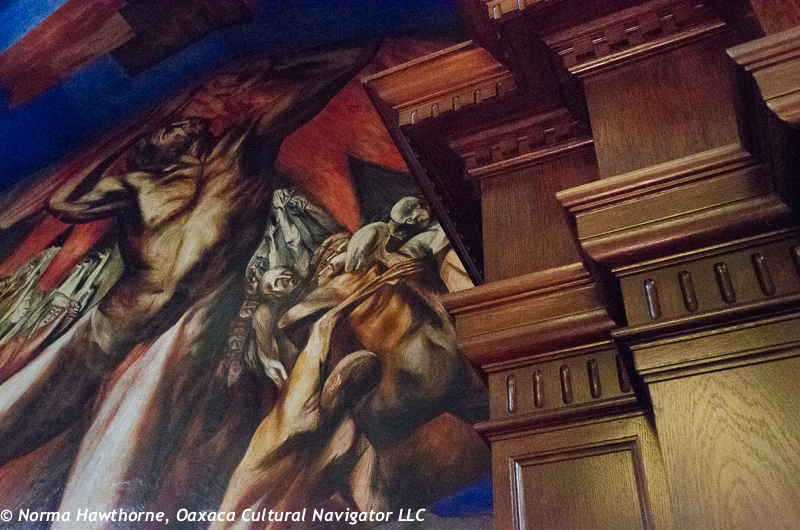 Note: If you arrive before or after the scheduled dining hall opening hours, you will be able to view the Orozco mural in natural light. 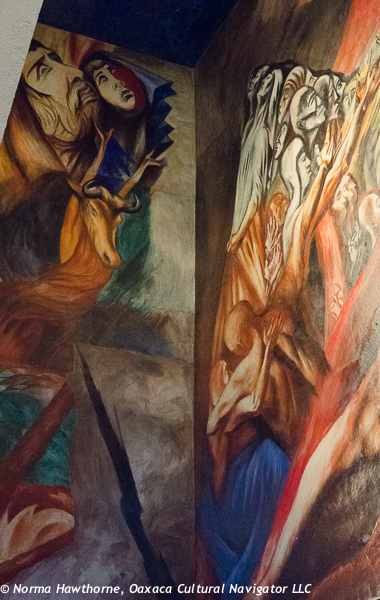 Incandescent lights illuminate the mural during the hours when the dining hall is open. 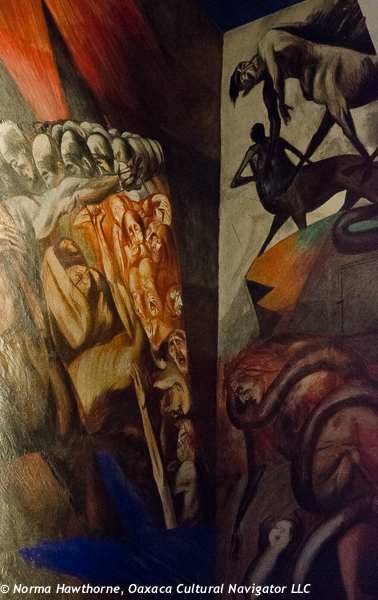 In my opinion this distorts the mural and the light casts an unwelcome glare. So, my recommendation is to enter the dining hall either between breakfast and lunch or between lunch and dinner. Best time to travel there: Between 9:30 a.m. and 1:30 p.m. I left campus at 1:30 p.m. and had an easy return to the south coast, again circumventing Los Angeles’ famed clogged freeways. They were born or raised in Santa Ana, California, which they call Santana. 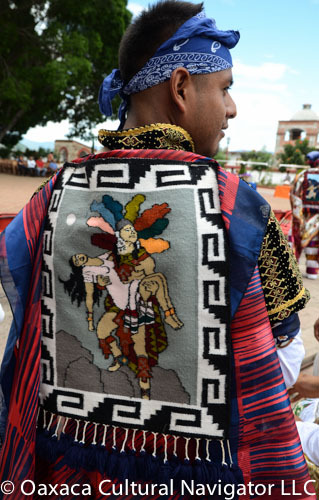 They keep sacred Zapotec traditions alive by practicing life cycle events from their Teotitlan del Valle, Oaxaca homeland. 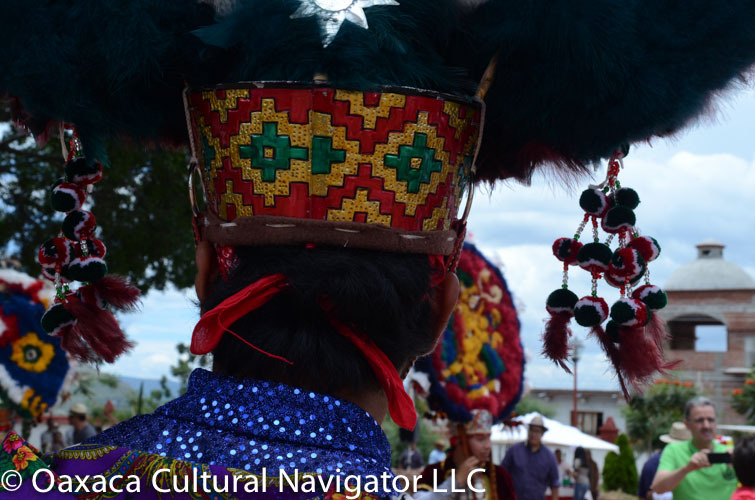 Most especially, these young men know what it means to be a Danzante — a dancer. 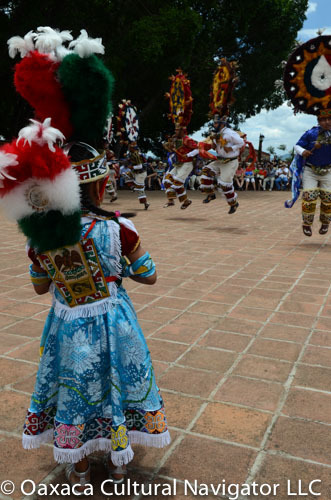 The Dance of the Feather or Danza de la Pluma is a ritual rite of passage. 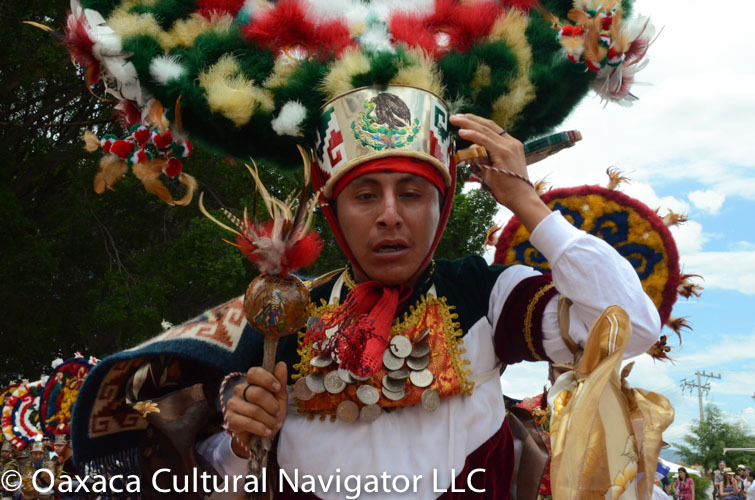 To become a dancer is to make a commitment to the principles and traditions of Zapotec life. 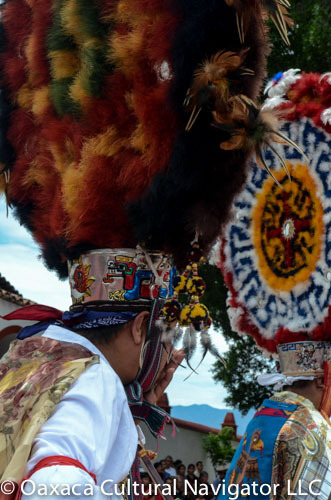 The Danza de la Pluma is practiced with as much passion, integrity, endurance and intention in Santa Ana as it is in Teotitlan del Valle. 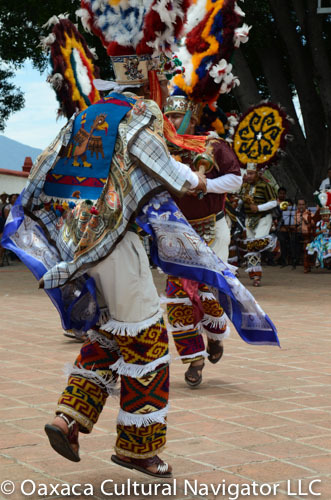 It is not a folkloric performance. 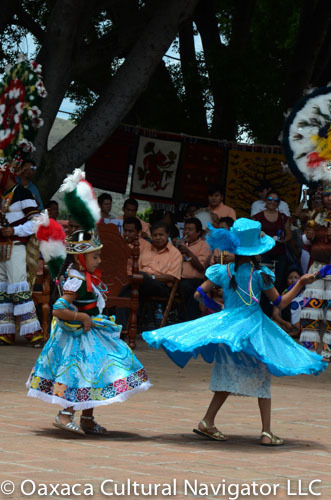 It is a serious part of Zapotec identity. 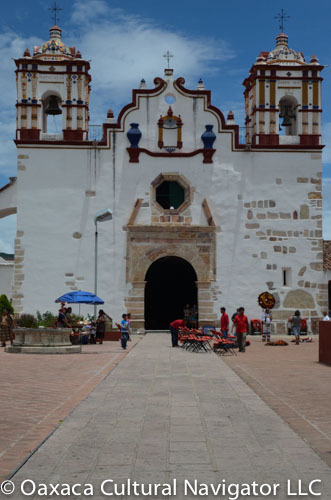 That’s why a group of young men from Santa Ana, fluent in English, Spanish and Zapotec, asked permission from the village leaders to return to Teotitlan del Valle and make the three-year commitment and live here for the duration. 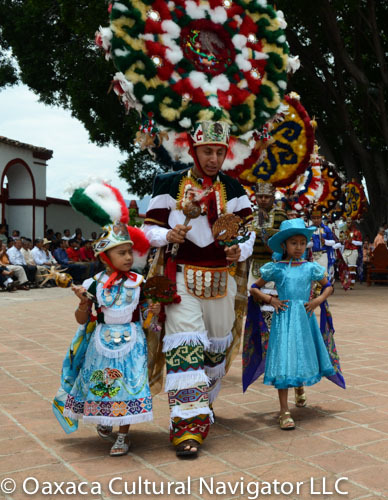 Their group debut was in the early July 2013 festival to honor the patron saint and church of Teotitlan — Preciosa Sangre de Cristo. 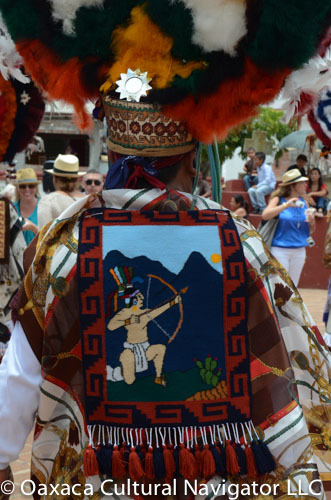 The choreography is different, the finely woven intricately designed tapestry that each dancer wears on his back was either made by the dancer or a father, uncle or grandfather. 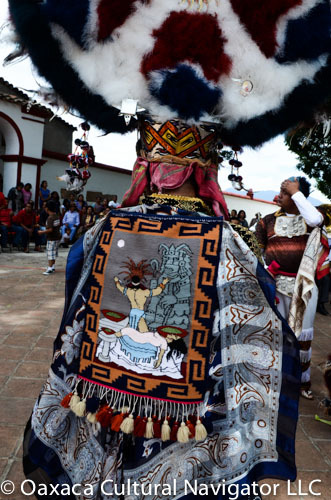 They leap, twist, kneel, and it looks as if they are flying, as if God is carrying each one somewhere deep into the pre-Hispanic past to bring forth the spirit of the ancients. Many brought their wives and young children with them. Some were reunited with family members — sisters, brothers, grandparents — after years of separation. 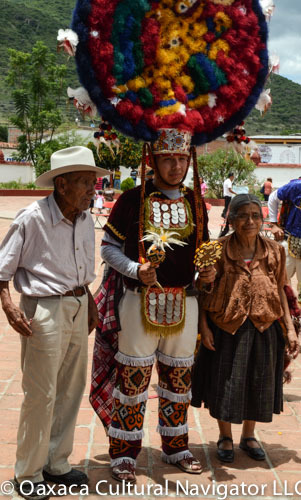 Some have never seen their abuelos — grandparents — since they were infants or if they were born in the USA, perhaps never before. 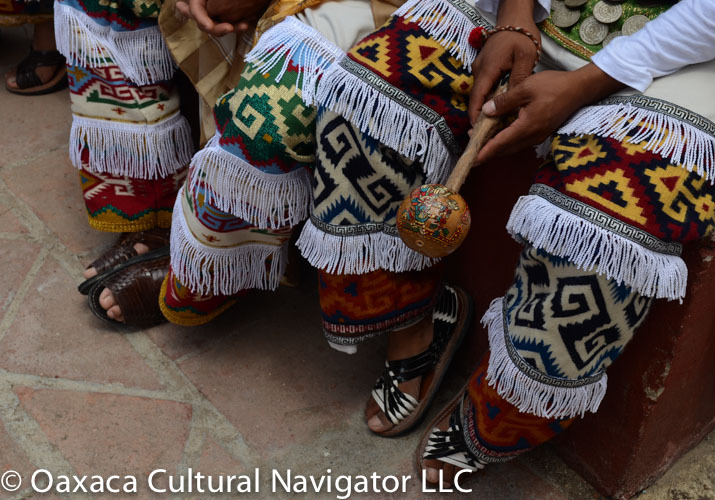 It was a thrill to watch this group whose spirit infected the entire audience– villagers and about 150 guests of Aeromexico, the Mexican airline that offers several flights a day between Mexico City and Oaxaca. 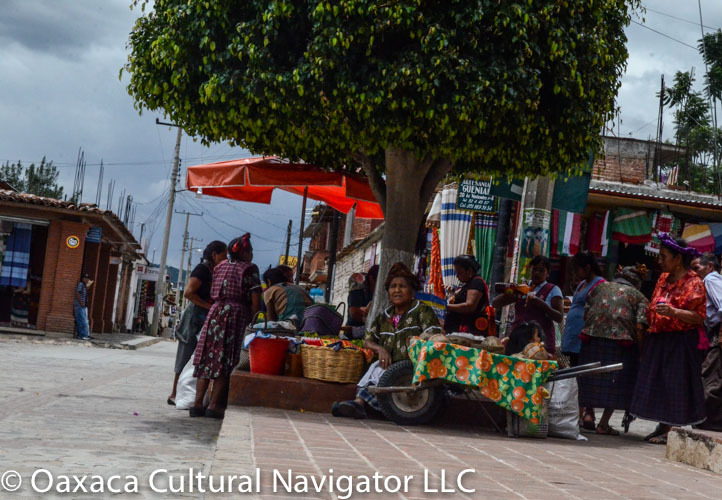 Tourism is the economic engine for Oaxaca and the weavers of Teotitlan del Valle depend upon visitors for their livelihood. The Dance of the Feather is iconic. 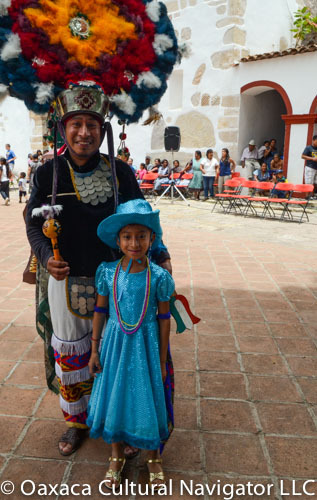 It is a history retold from generation to generation of the 1521 Spanish conquest, Cortes and Moctezuma, and the dual figure of La Malinche and Doña Marina. There are few stronger images to convey a sense of place and culture. Both before and after, I talked to many of the dancers who said they love it here so much, they are wanting to stay on after their three-year promise ends. 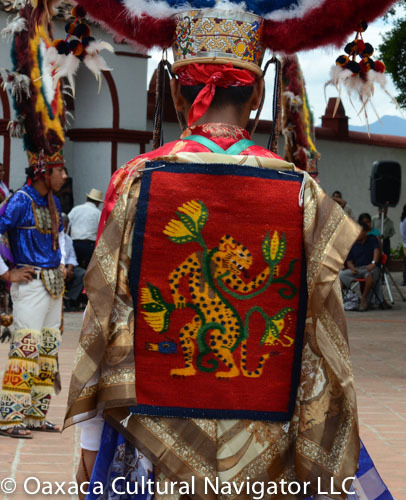 After the festivities came to a close, many of the guests walked out of the church courtyard to the adjacent community museum and rug market. 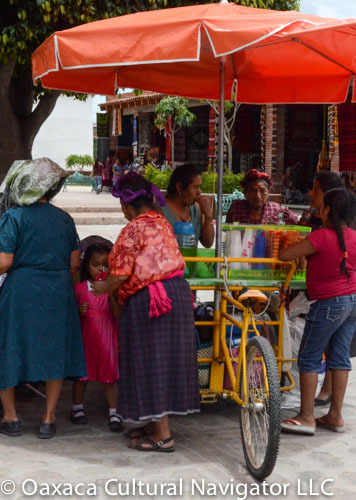 Just in time for a refreshment break, a bicycle vendor selling nieves — a Spanish word that means snow but what all of us know as delicious fresh fruit ices that Mexico is famous for! (Try the tuna — nopal cactus fruit.) Or, if you want something more substantial, there are homemade tamales in that wheelbarrow.